El Best Western Plus Green Mill Village Hotel & Suites se encuentra en el centro de Arcola. Venga y disfrute de las mejores atracciónes turísticas cerca de nuestro hotel. Precios bajos garantizados y ofertas exclusivas. Aquellos viajeros que busquen un hotel en el condado Amish podrán disfrutar de toda una serie de modernas comodidades en nuestro hotel de Arcola. Al reservar un hotel en la zona central de Illinois, merece disponer de un impoluto, cómodo y asequible establecimiento con el mayor nivel de hospitalidad en la zona central de Illinois. Con una excelente ubicación en pleno condado Amish de Illinois, nuestro hotel da la bienvenida de manera habitual a aquellos viajeros que deseen disfrutar de una completa experiencia durante su viaje. Situado a poca distancia de la Universidad Eastern Illinois y la Universidad de Illinois, nuestro establecimiento se ubica igualmente en el epicentro de la actividad universitaria. Tanto si se encuentra en esta zona de Illinois para recorrer el condado Amish como para visitar los campus de la universidad, es vital contar con la mayor comodidad. Al llegar la mañana, vaya de compras por los mercadillos de artesanía Amish y disfrute del mejor descanso en una mullida y lujosa cama con acolchado doble a su vuelta al hotel en una de nuestras amplias habitaciones. Asista al Festival Broomcorn o explore los jardines Rockome en familia sabiendo que podrá disponer de microondas y nevera a su vuelta al hotel para disfrutar de sus tentempiés y comidas preferidas. En nuestro hotel de Arcola todos los huéspedes serán tratados como un miembro más de nuestra familia. La búsqueda de antigüedades es una de las actividades preferidas de la región y desde nuestro nuevo y flamante hotel con todas las garantías de una cadena internacional podrá disfrutar de lo mejor del mundo antiguo y el moderno con la mayor comodidad. Los hoteles cercanos a la Universidad Eastern Illinois y la Universidad de Illinois gozan de unaexcelente ubicación junto a la carretera interestatal 57. Los empleados de CHI Overhead Doors se encuentran entre nuestros huéspedes habituales, así como los de Libman Corporation. Tanto si se encuentra aquí para asistir a una reunión con Masterbrand Cabinets o uno de los eventos anuales de la Union Pacific Railroad, nuestro hotel ofrece el espacio de alojamiento idóneo para viajeros de placer o de negocios. Disfrute de pasatiempos acuáticos en el Lago Shelbyville, de un recorrido en el campo de golf de Iron Horse o de la visita a la Raggedy Ann Home. El Arthur Cheese Festival es otro de los eventos de obligada visita, así como el Hippie Memorial, el evento anual Pumpkin Patch y el rancho Hardy's Reindeer Ranch o la plantación de manzanos Curtis Apple Orchard durante las vacaciones. Reserve su habitación en el Best Western Plus® Green Mill Village Hotel & Suites hoy mismo. Disfrute de su estancia en nuestro hotel. This is our 2nd time at this hotel and it is consistent with it's customer focus on quality. The room is comfortable and clean and the breakfast is terrific. We are so happy with this place, we plan to make it our stop every year when we head to Florida! It has been years since I stayed at a Best Western. This hotel is newer and WOW, surprisingly WONDERFUL!!! SO clean, updated, the rooms are BIG and have a kitchenette area. The bedding & pillows were nice...even had an extra blanket on the bed! I received a bag of goodies at check-in and they had fresh cookies for guests. HUGE parking lot that is VERY WELL taken care of. You won't regret staying at this location. A friend and I were in the area to visit a relatives and friends. We stayed 1 night in a ground floor room with 2 queen beds which was very clean and quiet. Besides all that what impressed up so much was a staff member named Ronza who was in charge of breakfast and dining room. I had put the powdered ingredients of a nutritional drink on a shake and added water but it was stuck and I try to stir it with a plastic knife. She asked if I needed help and brought 3 untensils from the kitchen for me to try as well as a clean damp rag as the situation got a bit messy. Next she offered to mix it for me if I preferred as I was dressed for worship and I obviously didn't want to soul my clothes. Once that issue was resolved she asked if we enjoyed our stay and we had a brief but lovely conversation. She offered to clear our empty yogurt cups, etc and asked if there was anything else she could do for us. We will definitely stay at this hotel again when in the area and a large part of that was because of Ronza. I hope she gets recognized for her above the call of duty behavior. Checking staff was very nice too. Highly recommend this. The room was beautifully decorated, very clean, calming environment, and mostly comfortable bed. We stayed in a king suite and there was plenty of room for my son to play with his toys. The best part of this hotel is the employees. Everyone was so professional and friendly. I could tell that they all enjoyed working there and it mattered to them that our stay was good. Breakfast was great and well stocked, the OJ was outstanding! I loved the photography throughout the hotel. The infused ice water is a fantastic touch that made a big difference for us as we prepared for another long day of travel. Keep doing this! This Best Western Plus was notches above the other BW's we stayed at during our travels this week. Thanks for the great hospitality! The staff at this hotel want everyone to feel at home. They are very friendly and accommodating. The breakfast was decent although I just ate the oatmeal. It was 8 minutes from my jobsite and easy to enter and leave. Reasonably new and in very good condition. 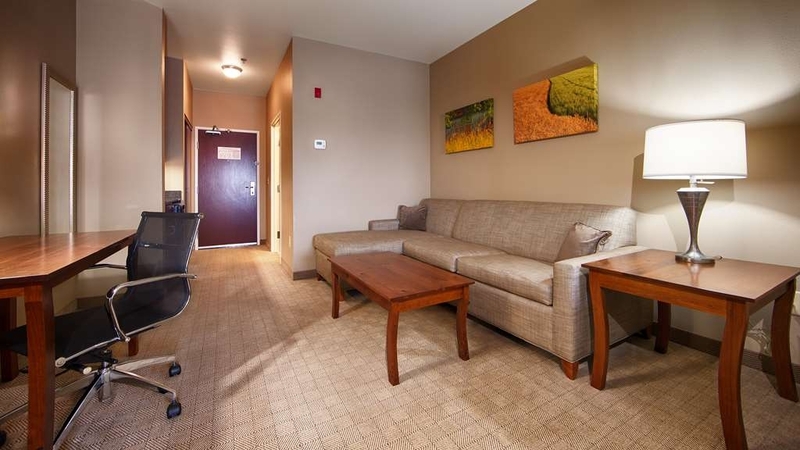 A stay at the Best Western Plus Arcola is something I am always looking forward to. Whenever I am traveling from the Southern states to the Midwest, I always plan an overnight stay at this hotel. The team at the hotel is just phenomenal, and I can't say enough about the high ceilings and the great taste decor. I feel like a member of the royal family when I stay there :-). Thank you so much for the amazing review. We LOVE that you feel like a member of the royal family, during your stays! We appreciate that choose our hotel each time you come to the area, as we know you have lots of options. We also like that you mentioned the décor. Our furniture in the guest rooms was locally handcrafted by the Amish and our photography throughout the hotel is of the local area and was done by a local photographer. We are so happy to hear that you enjoyed it. We can't wait until your next visit. Hotel was super clean, staff very pleasant, breakfast was hot and was continually monitors and restocked, very quiet, nice décor. Exercise room was all in working order. Pool little on the small side, but nice. We appreciate you taking time to leave us such a nice review. We are very happy to hear that you enjoyed the hotel, breakfast and décor. We are also happy that you liked our quiet, peaceful location. We hope to see you again! Cute quiet little town. Only hotel there but it is absolutely beautiful. Wonderful staff and loved the amish decor. Would definitely recommend to other travelers. Jeremy on second shift was very pleasant. Thanks for the great review. We are so glad that you enjoyed the hotel and the décor. All of our pictures were taken by a local photographer and of our local area. We love being able to share a bit of country setting and Amish culture with our guests! We hope that you'll stop in and see us again, if you're in the area. A recent stay was my second time at this hotel. Both were exceptional experiences. The hotel is clean. The staff is friendly and helpful. The room was clean and comfortable. The free breakfast offered an unmatched selection of items. I wouldn't hesitate to stay here again. This hotel comes highly recommended. Thank you for taking time to leave such an amazing review. We are very happy to hear that you enjoyed your stay and your breakfast. We hope to see you again, during your travels. Hotel was great, only problem was heat had not been turned on in room and took almost 3 hours to warm it up. Otherwise it was great and will stay there again. Breakfast was very good and a nice variety of items. Beds were the most comfortable ever and there were plenty of towels in the bath. Our little one sleeps in a pack n play. The king rooms have plenty of space to set it it up, store our stuff, and let him move around. The beds are comfortable, the rooms are clean and modern. The staff is always friendly and engaged. Thank you so much for the amazing review. We're glad to hear that you had lots of space for your baby to sleep and play. We hope to see you again if you're in the area. We stayed here when we were visiting our son at University of Illinois. It was about a half an hour south of Champaign, just off I-57. We arrived around midnight and were pleasantly surprised with how clean and modern this hotel is. We were checked in very quickly. I assumed the breakfast was going to be the standard Hampton Inn-type fare, but was amazed to see a tray of fresh eggs fried to perfection! They had bacon and sausage patties, and sliced cheese so that you could make your own breakfast sandwiches. I wish this hotel were closer to home because we would stay more often!! Thank you so much for taking time to write us such a nice review. We are thrilled that you enjoyed the hotel and the breakfast. We hope that if you're in the area again, you'll stop in. We enjoyed our stay. 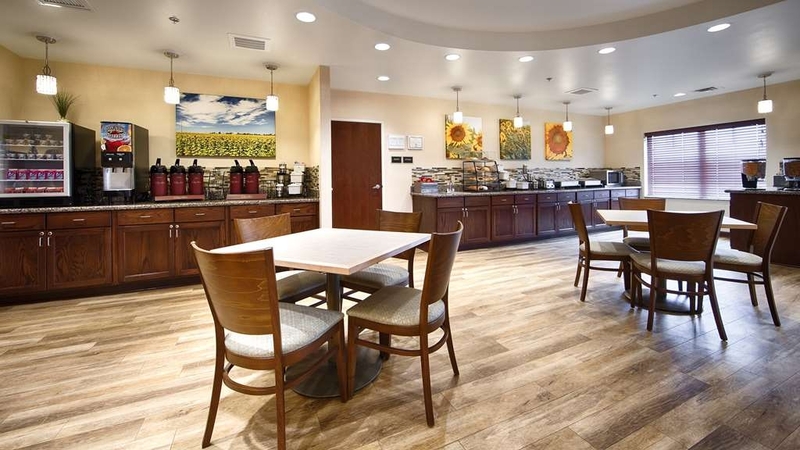 The staff was friendly, beautiful CLEAN rooms with high-speed wifi and Excellent Continental Breakfast: Biscuit & gravy, pancakes with fruit/nuts/toppings or syrup; bacon, muffins, danishes, milk, almond milk, orange juice, coffee, etc. Thank you for the amazing review. We appreciate that you took the time to leave such a nice review and we are very happy to hear that you enjoyed the hotel. We hope to see you again in the future. This is our third stay at this location on our travels. It has been consistent in quality and service. Room is well appointed and very comfortable. The location is convenient to interstate and access to Amish shopping. Thank you so much for taking time to write a review. We are happy to hear that you enjoy the hotel and keep returning! We hope that we'll see you again, the next time you're in the area. Thank you very much for the great review. We're happy that you chose our hotel for your girl's weekend, and happier to hear that you enjoyed your stay! We hope that you'll come in and stay with us again if you're in the area. "Great service modern very clean "
Thank you so much for the great review. We are very happy to hear that you enjoyed your stay. We're sorry that your clock was being difficult. We would've been more than happy to give you a new one. We hope that you'll stay with us again if you're in the area, and please let us know if you have any issues at all. We're here to help! Thanks again for taking time to leave us a review! Did have an issue when we first checked in as the room had some garbage left on the table by the bed. No problem switching rooms. New room was very clean. Stayed on a Sunday night so not many places open to eat and staff didn't seem completely sure on what was open. Probably would be helpful for the staff to know where to recommend for Sundays. Did find a bar/grill that we ate at and it was very good. It is a very small community so if you're looking for something to do, probably not the best place to stay. Nice place if you're just passing through. Thank you for taking time to leave us a review. We apologize about your first room and are very happy to hear that the second one was up to our standards. I am guessing that the room inspector forgot to grab the garbage on their way out, but I would look into it. It would be helpful if you could shoot me an email at [email protected], with your name and the date that you stayed, so that I can pull the paperwork for that day and just review the issue with the staff. Again, I'm sure it was an oversight on someone's part, but we'd like to be sure it doesn't happen again. Thank you again, for taking time to write a review.
"" Very Good but ? "" Great Hotel ...very clean , great staff and very good service. Only drawback is that we decided to stay here on this particular night as we wanted to watch the days replay of "Le Tour De France" but alas very very disappointed that they don't carry NBCSN on the available television channels. Had better selections at way cheaper hotels all over the country. Then we wanted to watch PBS news but once again they didn't have it. Guess one will have to call ahead if you ever want to see some particular show on a particular channel here at this particular hotel. Would/will we stay here again most probably as it is a very good hotel. Not when Le Tour is on that is for sure. Thank you for taking time to write a review for us. We apologize that we don't carry the TV channel that you were wanting to watch that evening. We carry a variety of other channels, but we understand your disappointment since you wanted to watch something in particular. We hope that you'll stay with us again if you're in the area. We can always recommend local sports bars or restaurants that show televised sporting events, if it happens to be on a channel that we do not carry. "Stoped to see raggedy ann"
Thank you so much for taking time to leave us a review. We are happy to hear that you enjoyed your stay and we hope that you enjoyed the Raggedy Ann attractions, as well. We do hope that we'll see you again next year! Thank you so much for taking time to leave such a great review. We hope you'll stop in again if you're passing through the area. From the friendly helpful staff, to comfortable room and great breakfast you can't ask for more when you need a place to stay for the night. the room was clean and spacious. the breakfast has such a wide variety of great food especially for a motel. We appreciate you taking time to write us such a nice review. We are happy to hear that you enjoyed your stay and we hope to see you again. My family and I stayed for one night for a quick weekend getaway. The room, the breakfast and staff was simply great. Got greeted with such a welcoming staff. Too bad I forgot her name but she was so helpful and was able to put our families together. (Two other families including mines went together but booked the hotel at different times) She help us to be close together. Rooms were very spacious with all the amenities and the room smell so good. Comfortable beds. We really enjoyed the pool as well. And well breakfast was wonderful. You will think I was at a breakfast buffet. So many different options for you to enjoy. Everything from pancakes to eggs to oatmeal. I wish I could have stayed another night. But I will definitely know where to stay now when I go back. Plus the location was very good. Close to the highway, gas station and restaurants. My family and I had a great time there. Thank you so much for taking time to leave us such a nice review. We are happy to hear that you enjoyed your stay and the breakfast. We hope that if you're in the area again, you'll come back and stay with us. My husband and I stayed here while vacationing in Amish country. I'm not sure how new the hotel is, but it sure is nice! Very clean, quiet, quiet location, breakfast was out of this world! The gym was perfect. The room was large and comfy. It was miserable hot when we visited, and the air in the room worked great. Good water pressure for shower. Amenities were good. I have absolutely no complaints about this hotel! Thank you so much for taking time to leave us such an amazing review. We are very happy to hear that you enjoyed your stay, at our hotel, in Amish country. We hope that you'll stop in and see us again, if you're ever in the area. "Top notch service and amenities." Thanks so much for great review. We are so happy that your enjoyed your stay and we hope that you'll come back and see us again. "Our stay at the Best Western in Arcola Ill."
We had a very nice 5 night stay at the Best Western. We were visiting our daughter and attending our grand son's graduation. I would recommend this place to our friends and family. The service was great and the room was what we needed. The breakfast was very good. Always a clean Hotel, with great staff and an awesome breakfast !!! The pool was well maintained and the grounds are almost park like. It is great to have a hotel we can always count on. Very close to Arthur-be sure and make the trip! Thank you so much for the great review. We appreciate you taking time out of your day to review the hotel. 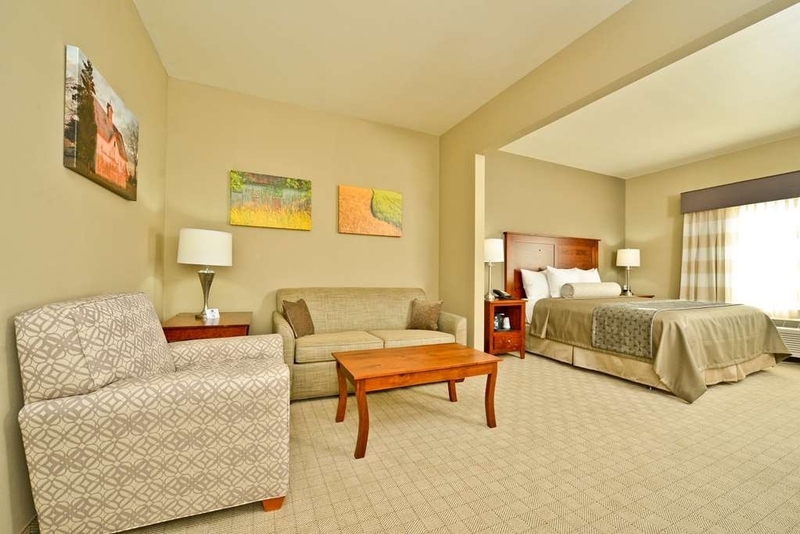 We stay at Best Western Plus Green Mill Village Hotel & Suites several times a year for pleasure. Every visit is predictably great. 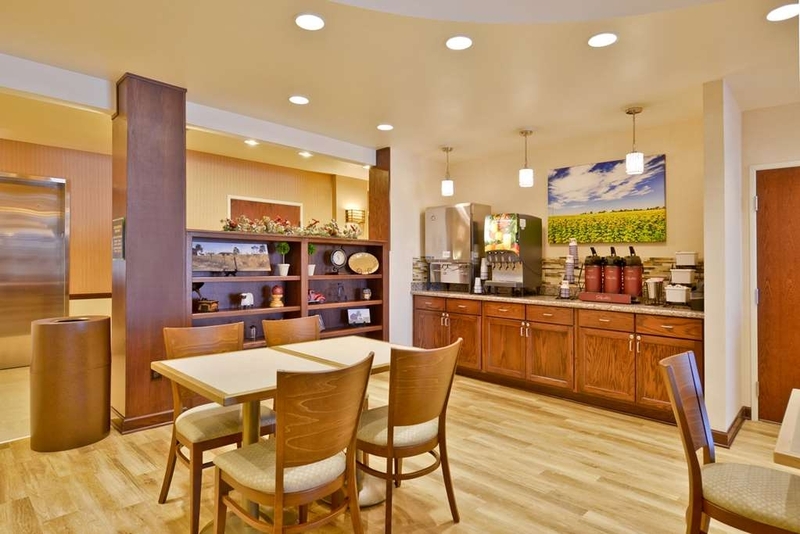 The complimentary breakfast is the best we have found anywhere and the kitchen staff is ready to help with any needs. Very clean rooms and quick, easy check in and out. We highly recommend. We are very happy to hear that you enjoy your stays with us and we really appreciate that you keep coming back! Thanks so much for taking time to leave us a review. We booked this hotel only because it was the closest we could find for my niece's graduation from EIU in Charleston. We were very pleased with our choice. It was an easy 20 minute drive to the university on quick roads. The hotel itself was beautiful and our room was quite spacious, very clean and comfortable. There was a microwave and refrigerator in our room along with coffee and standard amenities. The staff was friendly and helpful and the breakfast included was typical. Thank you so much for the wonderful review. We are very happy to hear that you enjoyed your stay. We hope to see you again! There aren't many choices around the Arcola/Arthur area...the closest is Mattoon, IL. I can't remember the age of this hotel but it is not classified as old and has held up pretty good over the past years. We have stayed there several times, the most recent was 2 years ago. 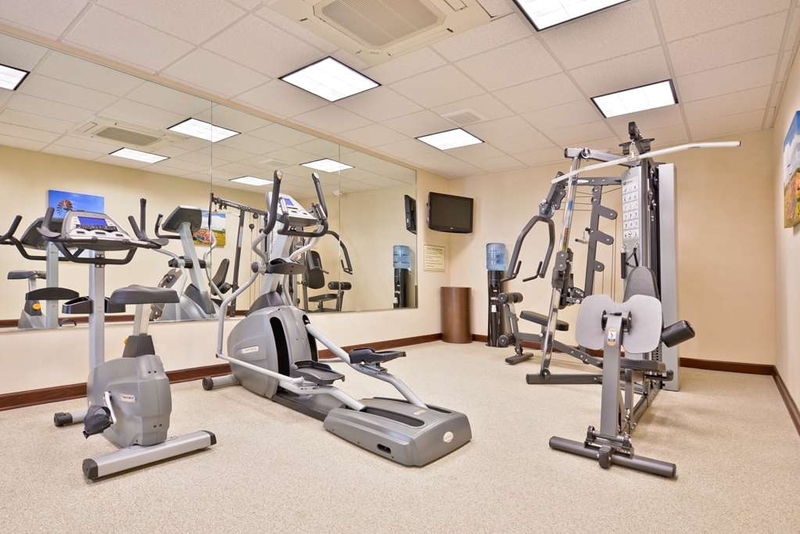 The place is very clean, the rooms are big, the breakfast is more than adequate, it has an indoor pool and fitness room, meeting room and small business center. There is plenty of parking and it is free. While everything is clean and pristine, with its age and normal wear and tear, they need to begin changing out some of the carpet and in room sofas. The mattresses are great and my only comment is that the sofa in our room is wearing down. This is only noticed because we stayed there when it was new and a couple times after. I still highly recommend it. The staff is super friendly and accommodating and the cleaning staff do an awesome job. I still rate them "Excellent"! Thank you so much for taking time to write us a review. We appreciate the feedback and hope to see you again. If you're interested in looking into Illinois Amish Country this is the place to stay. It is right off the highway 57 and close to all the Amish acton. It is quiet with all the right amenities. They have a pool, a workout facility and a great breakfast. Thank you so much for the great review. We are happy that you chose to stay with us and we hope to see you again during your next visit. 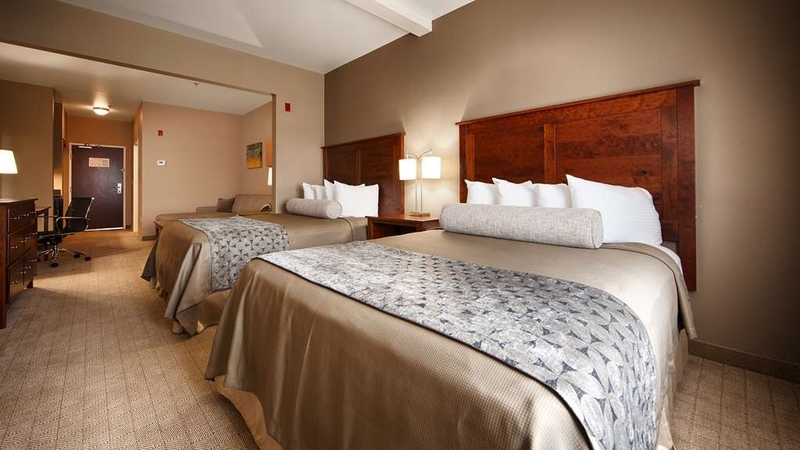 "They put the "Best" in Best Western"
We stayed overnight on Saturday, April 14th and were VERY IMPRESSED with the cleanliness, friendliness and ease of checking in and out were seamless! All the staff was friendly and helpful. The breakfast was MUCH more then we expected and was very nicely set out with hot and cold options. The bed was a dream to sleep on! Usually my husband complains his back hurts after staying at a hotel but no complaints this time! Thank you so much for the amazing review. We are very happy to hear that you enjoyed your stay, your breakfast and got a good night's sleep! We hope that you'll stop in again if you're ever in the area. I travel to Arcola at least one time per month and I always stay at the Best Western. The staff are very nice and helpful! The rooms are nicely appointed and comfortable! Breakfast is very good. It's nice they have a pool and fitness room but I don't very often get an opportunity to use them. Thank you for taking time to write us such a nice review. We are thrilled that you're a repeat guest and we look forward to your next stay with us. Thank you so much for taking time to leave a review for our hotel. We are very happy to hear that you enjoyed the hotel and the breakfast. We hope that if you're in the area again, you'll stop back in again. Probably because it was the off season they had very few guests. Hotel is pretty new so we had no issues and the beds were comfortable. You can tell that it is in Amish country by the beautiful decor. Thank you very much for the nice review. We are happy to hear that you enjoyed the hotel and we hope to see you again. The employees were very professional and friendly. This Best Western is a very nice place to stay. It's just off I-57 on the edge of a small farming community. The internet worked very well. I highly recommend this hotel. Thank you so much for the review. We are happy that you enjoyed your stay. We hope you'll stay with us again if you're in the area. Hotel appears to be new. Rooms are spacious and comfortable, and include a microwave and fridge. Hotel and rooms are very clean and quiet. Breakfast is adequate. Cookies and drinks available all the time. Food and gas are not nearby. Thank you so much for leaving us such a great review. We are very happy to hear that you enjoyed the hotel. We do have a few restaurants and gas stations right across the overpass, so just about a 1 minute drive. We also have a couple places that deliver. We are so sorry that you missed these places. Anytime you're looking for something in the area, feel free to stop and ask a staff member. We are happy to help. We hope that you'll stop in again if you're passing through the area. Thank you so much for leaving us such a great review. We have been open for just over 5 years and it is our goal to keep the hotel looking brand new. We are blessed with an amazing staff that takes pride in keeping the hotel clean and our guests well taken care of. We are very happy to hear that you enjoyed your stay with us and we hope that you'll stop in again if you're ever in the area. "One of the cleanest Best Westerns"
We needed a place to stay in the middle of Illinois and decided to try this hotel. This is one of the cleanest hotels we've ever stayed at in this price range. Small indoor pool but an adequate exercise room. The rooms are perfect as far as I'm concerned. The breakfast was one of the best around. Thank you so much for taking time to write us a review. We are so happy to hear that you enjoyed your stay. We hope that you'll stay with us again if you're in the area. We were greeted by Jeremy, he was very attentive and helpful. He knew what he was doing. Our room was very lovely, hotel seemed to be new. Bed was very comfortable. the breakfast, was not that great.The eggs were dry and bacon, not good. Everything else looked good, clean. Thank you for taking time to write a review for us. We are sorry you didn't enjoy the bacon and eggs. I will speak with the kitchen staff and ask them to pay special attention to those items. We hope to see you again soon. We stayed here to attend a family funeral. We had stayed two other times for family business. Each time our stay was excellent!!!! The rooms were extremely clean. The breakfast was phenomenal, and the staff was so friendly and helpful. Thank you so much for taking time out of your day to write a review for us. We are very happy to hear that you are a returning guest. We hope that you'll stay with us again when you're in the area. "Great Place, Clean and Friendly "
This was a great hotel to visit. The rooms are large the beds are comfortable and clean. The breakfast is the usual budget breakfast. The staff was very accommodating in the breakfast area was clean. Overall a great experience at a great price, highly recommended. Thanks so much for the great review. We are so glad that you enjoyed your stay, and we really hope to see you again. "Breakfast was great, really nice place"
I picked this hotel because of the great reviews and they were correct. Most hotels in this price range are not nearly as nice. This is the second Best Western we have stayed in recently, and both exceeded expectations. This one appears to be well managed. A bit surprised to find such a nice place here. Thank you so much for choosing our hotel! We are happy to hear that you enjoyed your stay. We hope you'll stop in again if you're passing through town. We would also like to thank you for taking time out of your day to write a review for us. I travel from North to South several times a year and this will be one of my stops for sure!!!! The hotel is super clean, staff is great, breakfast is better than most places and my wife and kids loved the place!! We are so happy to hear that you enjoyed the hotel and even happier to hear that you'll be returning. Thanks so much for the great review and we look forward to seeing you again, on your next trip. We always stay at this hotel on our trips north.. It is always clean and comfortable. There is plenty of parking. We love the rural feel although the hotel is right off the interstate. The breakfast is good with some hot and cold items. The rooms are spacious. We have never experienced noise so we sleep well. You can not walk to restaurants although several do deliver to the hotel. Thank you for choosing our hotel on your trips North. We love that you keep coming back, and we love the great review. Thanks so much! This is always a great stay in Amish country. Breakfast is wonderful. Afternoon cookie are a plus. Coffee is always available. Close to outlet mall and Amish shopping. Conveniently located near Interstate. Thank you for the great review. We hope you'll stop in again when you're in the area. We enjoyed our stay. We frequent this hotel every year to visit with friends and family in the area. The staff is always pleasant. The hotel is well maintained and the breakfast is good. The location is off the Interstate which makes it easy for us to get to where we need to go. In general our stay is pleasant, we did feel this last stay our room was not as clean as in the past, minor details nothing big. The bed was also not as comfortable. This was a very nice clean hotel to visit if you are in the area or passing through. The people are very friendly and helpful. It is a good place to stay if just passing through or there to visit the local Amish community. Thank you so much for writing us a review. We hope to see you during your next trip through Amish country. We met with family from Wisconsin. We are from Tennessee. This was our half way point. Everyone enjoyed our time together. Hotel was great. Will be back soon. Great area around hotel. We did shopping and eating. Thank you for taking time to leave us a review. We are happy to hear that you'll be coming back again. We always look forward to staying here! The staff at the desk is always friendly, and they really make you feel welcome. The rooms are always very clean, and have comfortable beds. We enjoy the breakfast here, and the staff that works the breakfast area. We really think this Best Western is an excellent value. Thank you for the amazing review. We love you look forward to your stays with us, and we can't wait until your next visit. We were part of a wedding party staying here, spent two nights. Rooms, service and staff were wonderful. Very clean and comfortable, spacious rooms, great bed. Breakfast both mornings were well stocked, but the hot foods were not kept warm, and were room temperature which does nothing for eggs or breakfast meats. Other than that, no complaints. Thank you so much for the amazing review. We apologize that you didn't feel some of the foods were warm enough. We recently purchased new warmers and were having issues with the foods being too hot, so we were trying a lower temperature. I think we have found a happy medium, so I hope that you will enjoy it more during your next stay. We hope you'll stop in again soon. "Excellent Choice in Heart of Amish Country"
Hotel was very clean, the staff was very helpful and wonderful to work with. I found the bed to be slightly firmer than my pillow top mattress at home but I was still comfortable and slept well. Our room was clean and spacious. We greatly enjoyed our stay. The fruit, pancakes, sweet rolls were great at breakfast. The bacon was good too but the eggs left a lot to be desired and I could not eat them. I still would say they had a very nice selection of choices and good food to eat and I just picked something else. Through the past few years we have stayed here several times and will do so in the future when we visit Amish Country. Hotel is clean, service is outstanding in every way. Front Desk staff are knowledgeable about things to do in the area including the best places to eat. Thanks so much for the review. We look forward to seeing you again soon. If you are looking to stay in the Arcola /Arthur area i recommend this hotel highly, have nothing bad to say only wonderful things. Staff , room, breakfast all excellent. lobby is a beautiful place as is the rest of the hotel. on a scale from 1-10, a 12!! We stay here several times a year. Everything goes well. It is always clean and the people are pleasant. Not real close to a major town. But, there are plenty of places to eat. . Recommended to everyone. We appreciate you choosing our hotel whenever you're in the area. Thanks so much for taking time to write a review for us. We hope to see you soon. Our family and friends stayed here for a family wedding. The reception was held in the banquet/conference center. The weekend was perfect! The entire hotel is clean and pleasant and the employees were kind and helpful. I would definitely stay here again and recommend to my friends and family! We are so happy that you enjoyed your stay during the reception. We also appreciate that you took the time to write us a review. We hope that you'll stop in again if you're in the area. "Best best Westerns I've ever stayed in, in a rural area." Almost the pefect hotel. Room was a bit akward though. Tv was on the side wall away from the bed. Seems like the bed was in the wrong place. Everything else was what I would expect from a newly built hotel. Thank you for taking time to write a review for us. We do have a couple of adjoining rooms that are set up differently than the others, due to the size and shape of the room. 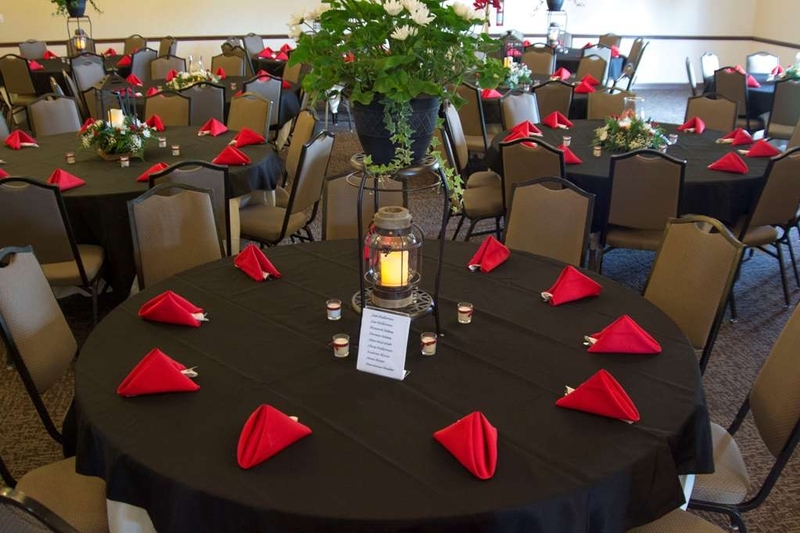 If you weren't happy with the set up of that particular room type, let us know when you call for another reservation and we can help get you set up in a room that you would be more happy in. We hope you'll stop in again soon. We love staying at this hotel when we are in the area visiting friends. Friendly staff, welcoming atmosphere, clean and well-taken care of property. We were in the area for a wedding reception at the conference center, which was also top-notch. "Nice stay in Country setting"
We come here once a year for a BBQ contest in Arthur. We have found the Best Western to be the nicest hotel in area. They have a very clean place and serve a very nice breakfast. There is a pool and fitness room that are both very nice. The hotel is very clean and well appointed. Breakfast was wonderful. One of our two rooms smelled of smoke. Staff deodorized the room since they were fully booked and couldn't move us to another room. The Wi-Fi was not dependable and went in and out. Overall, it was a very nice hotel, and we would stay here again. Thank you for your review. We are a non-smoking hotel, so your room should never smell like smoke, and we apologize if it did. We also have recently switched WiFi companies, as we are trying to eliminate WiFi issues. We hope that if you are in town again, you'll come back and stay with us. I wouldn't have expected a hotel in "small town Illinois" to be so nice. And the breakfast was great! Real fried eggs, not phony eggbeaters. Beautiful decor and the property was well maintained. A true treasure and we will definitely stay here again when we come to visit family in nearby Mattoon. Thank you so much for the amazing review. We hope to see you again on your next trip.
"" One of the Best ""
One of the Best hotels in this price range that you will ever find. Very well kept and maintained. Very quiet and clean. One of the Best Breakfasts that we have encountered in the many hotels we have stayed at Worldwide. The management deserve a pat on the back for their premises....well done you should be proud. If you are in the area and looking for a place to rest your head stay here it is worth the stop. The furniture in each room is very good...very classy. We appreciate that you took time from your day to share your thoughts on our hotel. We are so happy to hear that you enjoyed breakfast. We always crack our eggs fresh daily. Some days we serve them fried, and some days we serve them scrambled with an option of fresh peppers and onions, but they are always cracked fresh. I noticed that you also mentioned the furniture in the guest rooms. Our furniture locally handcrafted by the Amish and we are very proud of it. If you peak on the bottom of a table next time, you will find a seal that tracks each piece back to the very person who made it. We would even be happy to point you in the right direction, if you're ever interested in owning something similar. We hope that if you are in the area again, you will stop back in. This was a beautiful large room and very handicap friendly. Staff was helpful with the directions to the surrounding businesses. But if you stay here, remember to bring your own hair dryer as there was none in the room. That you for taking time to write a review for us. We actually do provide hair dryers in each room. They are hanging in a handy little bag on the back side of the bathroom door. We are sorry that you missed it. If you ever stay with us and you have trouble finding anything, or think something may be missing, please call the front desk. We are happy to answer any questions and help out in any way that we can. We hope that if you're traveling in the area again, you'll stop in and see us. The hotel is extremely nice and clean on the in and outside. I enjoyed my stay here. The breakfast offered was nice, but the seating area was a little cramped with the hotel as booked as it was. I would recommend this for anyone staying in the area. Thanks so much for taking the time to write us such a nice review. We are so glad you would recommend us to anyone staying in this area. We appreciate that and are looking forward to having you stay with us again. We have stayed here in the past and it has always been clean and comfortable. Would recommend...Good value for the price! Staff is very accommodating and concerned for your comfort. 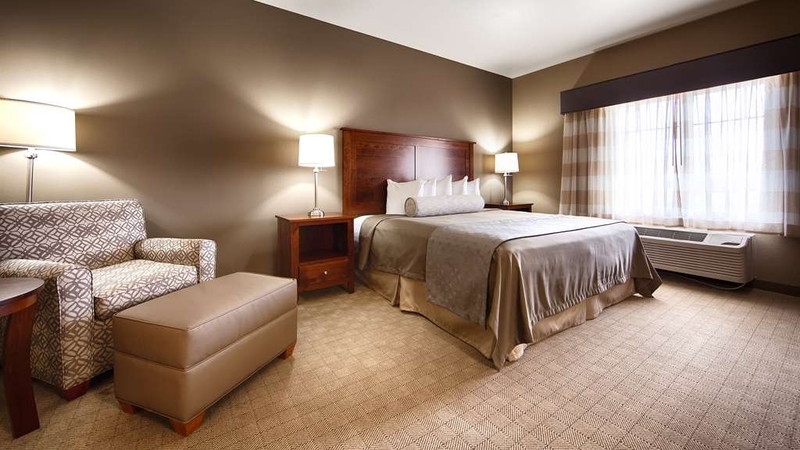 Convenient to the interstate and close to nearby Mattoon...we prefer to stay here than in Mattoon! Thank you for writing us a review. We appreciate you taking the time to do so. We are glad to hear you are a returning guest. So we look forward to seeing you in the future. 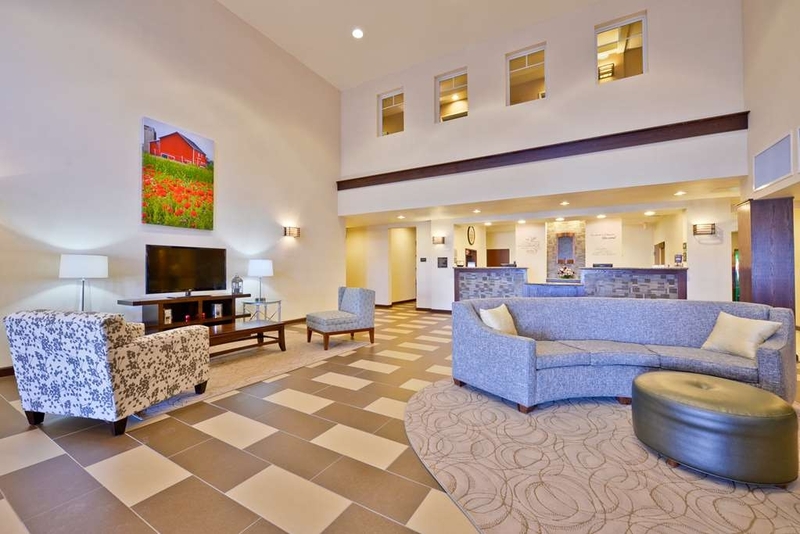 We were very impressed with the Best Western Plus in Arcola, IL. Very clean and modern. Easily accessible and the complimentary breakfast had a variety to choose from. It was a surprise find on our way to Casey, IL to see their BIG stuff in a small town. Thank you for taking the time to write us a review. We are happy to hear you were impressed with our hotel. We hope you stay with us again when you are in this area. Stayed for two nights at this location. Very clean, quiet location. Breakfast was very good and staff was friendly. Overall a very good experience. Only problem we had was that GPS had the location 1000' away from where the hotel was located. Very pleased with this hotel. Clean. Well appointed. Friendly staff. Convenient location to meeting I was attending in Decatur. Reasonable rate. Easy check in and check out. Good breakfast selection. No problems with my stay. Will return to this hotel when I am in the area. This is a great hotel! It is very quiet, clean, and everyone is very helpful! We would come back again in a heartbeat. We had a King Suite and could have slept several more. This is a new hotel. The pool was indoors,. I wish there had been an outside one, but understand an indoor pool can be used the whole year. This was a no fuss two day get away that we needed. I wish all of our hotel stays were this pleasant. "Excellent Hotel- feels like home"
I was very happy w/ my stay here. I was on business, and quite honestly I want a nice retreat (especially when I'm away from the pleasures of my home). This place was VERY CLEAN, breakfast was great, fitness center nice, and my room VERY homey feeling. The staff did a great job as well. I am very satisfied and WILL be back when I'm in the area again on business! Have spent time at this hotel different times. I love the hot bar breakfast, internet in room, and the beds were wonderful. Great location , right off interstate and easy to get to. Loved the room decorations, it was like a Spa Bedroom! Will be staying at Best Western again, whenever I travel. Great price and friendly staff! "Great place - Stayed during eclipse, great price"
Great hot breakfast, and they managed to keep up with the whole hotel coming down at 6:30 AM to get breakfast and run off to see the eclipse. The pool was nice and warm. The hotel and room were in excellent shape... very clean, and looked great. Lots of plugs for your devices in the room. A great place to stay for the price! Our family traveled to Southern Illinois to observe the eclipse and had a wondeful stay at the Best Western. We were greeted with a gift bag of snacks and water on check-in. The room was large, the bed was very comfortable and the breakfast was more than adequate. We looked at several hotels in the surrounding area, some running as high as $1400, but Best Western offered their room at $129 not taking advantage of the many travelers to the area for the eclipse. Clean hotel with friendly staff. Well worth the money and the free breakfast was a great surprise. Hotel is close to Arcola and highway 57. The local Amish people are also very friendly and make you feel welcome. Located in the heart of Illinois Amish country, this hotel is by far the best accommodation in the area. It is just east of downtown on Il133 just off I57. The rooms are large. Suites are available and consist of a sitting area with couch separated from the sleeping area by only a partial wall. Rooms are very clean and have a refrigerator and microwave. In the rooms and common areas the hotel displays beautiful local photographs of the Amish life. Breakfast is included and very satisfying. We stay here every year for our family reunion. We have never been disappointed. Pool is always working and clean. Which is our kids favorite part of the stay. Rooms are big and clean. Breakfast is always great. Staff is always wonderful too. There's no other place in Arcola I would stay. This Best Western was wonderful. The staff was extremely friendly and helpful that everything we needed. It is conveniently located near everything we were there to do. On and off the expressway was extremely easy with the exits and entrances right down the street. This hotel does everything right for a good price. The hotel is clean. The bed is comfortable. Plenty of parking. This hotel is near the Amish country so it is pleasant to drive through that area if you have time. The hotel is right off the interstate. There is nothing within walking distance however. The breakfast is always adequate. There is an indoor pool although we did not use it. We stayed at the Best Western and ate 2 meals at the attached Green Mill restaurant and were completely satisfied with hotel and dining. The staff at both were extremely friendly and went out of there way to be accommodating to our needs. Totally satisfied and would recommend both!! Thank you so much for taking the time to write us such a lovely review. We are very pleased that you were satisfied with your stay. We look forward to having you stay with us again. Our family group of five heading from Sherwood, AR, to Ludington, MI, and back have been fans of Best Western for several years now. Accommodations are always clean and comfortable. We had stayed here on previous excursions, so I had no qualms about reserving our rooms online ahead of time. We love staying at this Best Western. We were pleasantly surprised at the allergy friendly breakfast items. I was offered almond milk and they had real eggs, not powdered and gluten free items as well. This is huge for when you are traveling. Bed was on the soft side and some carpets in hallways need attention.Overall a great stay! 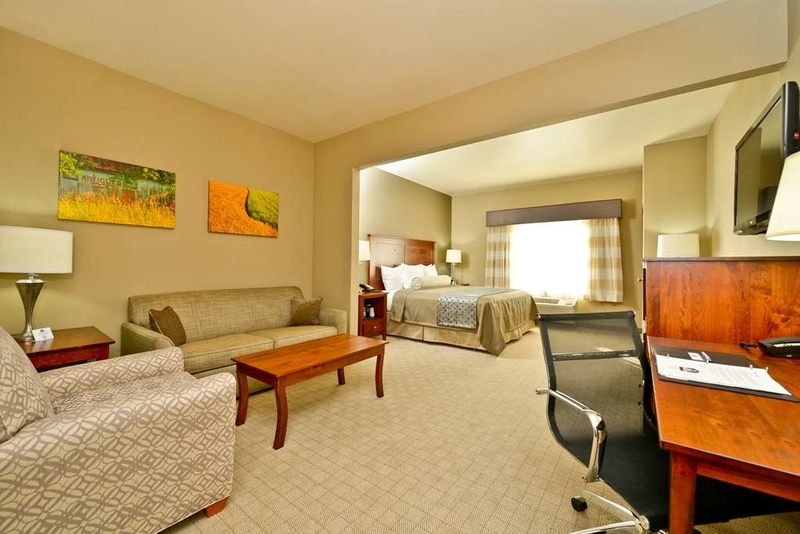 "One of Best Western's Finest Hotels"
We have used Best Western Hotels as our standard hotel whenever we travel and we were really impressed with Best Western Plus Green Mill Village Hotel & Suites. We have booked another stay at this Best Western during our return trip to Florida. Hotel is located close to highway but sits at the edge of a farming community surrounded by fields which makes it very peaceful and quite. The inside is. Very clean and staff was well knowledged and professional but still down to earth and friendly. The hotel is decorated around the Amish area culture. The walls are painted in natural colors and amish canvas pictures line the hallways and fill the rooms with the idea of a more simpler life. The furniture used in this hotel was actually hand crafted from the Amish. This hotel just makes you feel relaxed and at home. The Breakfast was delicious and there was plenty of food to choose from. Eating area was kept clean and food was continually being added while people were coming and going. I will keep coming back to this hotel when I go through central Illinois, it just feels like home. This is a relatively new hotel, so the amenities are modern & very well kept. The front desk clerk was very knowledgable on the area & all of the things this Amish community had to offer. The room was clean & the beds were comfortable, but the lighting in the room & the bathroom were terrible. The wall opposite of the beds, where you open your luggage had no lighting whatsoever and the lighting in the bathroom made it difficult to see to put on your makeup. The lack of lighting was a turnoff for me so I'm hoping my suggestion about it to the front desk will make a brighter room for the next patron! "Great service by the staff, had a full breakfast, room was clean and spacious." This hotel was right off the interstate. The desk clerks were very friendly and helpful. Had hot cookies ready when we arrived. The room was spacious and was very clean. The bed was comfortable. The breakfast was great. It was a full breakfast. Well stocked and the lady attending to it was very welcoming and friendly. Would highly recommend. Thank you so much for taking time to write us such an amazing review. We are so happy to hear that you enjoyed your stay. We would love for you to stop back in during your next trip through town. Stayed here to visit Amish country and attend the show they have at the hotel. Very nice place with a good breakfast. Our room was very clean as was the lobby, but the elevator and hallway carpet needs a good cleaning and is showing a lot of wear. It is a surprisingly good hotel for a rural area. Thank you for taking time to leave us a review. We are very happy to hear that you enjoyed your stay at our hotel, as well as the show. We are aware that the carpet is starting to show wear and we hope it didn't take away from your experience. We are looking into options to repair or replace the carpet. We hope that you'll stop in again if you're in the area. Best Western Plus. The hotel clerk was friendly and helpful. Hotel provides complimentary toiletries if you forget something. They also have a small area for you to purchase essentials.The rooms were super clean. The artwork in the halls and rooms is really representative of the Amish scenes in the area and is beautiful. The furnishings are also very nice and my room had a microwave and mini fridge. You could really make yourself at home here with the closet behind the door in your room and nice dresser for your clothing. There's also a desk and comfy chair with ottoman too. The pool area was okay, but a lot of bugs in there the day we visited. The breakfast was very good. They offered a wide variety of items to choose from and the attendant kept everything clean and well stocked. The morning I was there, men were working right outside the hotel entrance with jackhammers and gas chop saws cutting concrete starting at 7am. Every time the automatic doors opened while we were having breakfast, the noise was taking over the lobby. We went outside (for fresh air LOL) and dust was flying everywhere, causing us to have irritation with coughing and sneezing. We couldn't even carry on a conversation outside because of the noise. Our vehicle was also covered in dust. I thought about whether or not to include this hotel construction or repair in my review, but decided I should because it really affected our experience. Other than this, our hotel stay was really good! Thank you for taking time to write us a review. We're glad that you enjoyed our hotel. We apologize that you were affected by the construction, but there was a minor incident between a car and one of our brick pillars, so the repair was necessary to keep our hotel looking nice. We hope that you'll come back again, and enjoy the peaceful countryside. This hotel is fancier than any Best Western I've ever been in. The lobby is beautiful, as are the rooms. 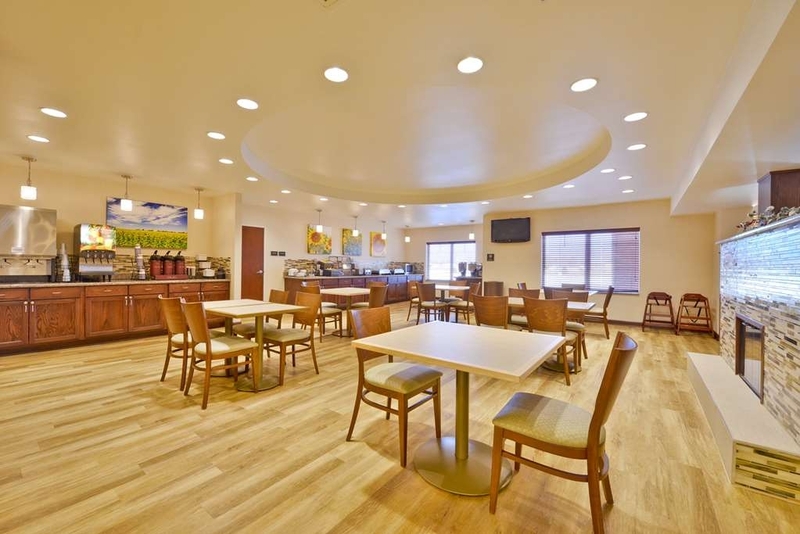 The entire property is spotless, and the employees are friendly and efficient. It is right off 57 and is a great choice for a hotel when visiting the Amish area or just looking for a good place to stay along the highway. The price is right, too. We are so happy to hear that you enjoyed our hotel. We appreciate you taking time to leave us a review and we hope to see you again. My stay here was pleasant as always. The entire hotel is very clean and the staff is always pleasant and professional. I will definitely stay here again. I would recommend this hotel to anyone looking for somewhere to stay. Thanks so much for your kind words. We are very happy to hear that you enjoyed your stay and look forward to seeing you in the future. Very nice hotel, relaxing atmosphere, very accommodating staff. Also had laundry service available, which was very helpfully as we were on a motorcycle trip with limited storage so it have us a chance to freshen up our clothes. We appreciate you taking the time to write us a review and we value your feedback. We hope to see you again if you're in the area. Thanks for taking time to leave a review for us. We appreciate your feedback and we're excited that you enjoy the hotel. We hope to see you again. This hotel was very clean. The staff was so friendly and helpful. The breakfast each morning was delicious. The beds were comfy, the rooms were clean and updated, and the shower was amazing! We were extremely happy during our stay. We would highly recommend this hotel to anyone that is traveling to the area. "BEST KEPT SECRET IN NORTHERN ILLINOIS"
This is a FANTASTIC hotel. It is hidden in a corn field in Arcola, Illinois. Everything from the employees, service, and actual property is A-1. We stay here whenever we pass through going to Wisconsin on vacation. The people are all friendly, and the rooms are comfortable and clean. You can't miss when you stay here. "Best Western - Great accomodations"
This hotel was very clean & comfortable. The beds were perfect for my taste (which is a first for me & I travel ALOT!) Nails the Midwest motif. Atmosphere was cute. Staff very friendly and accommodating. We stayed here to go to a farm toy sale as we have done many times. Everything went really well as usual. One time we had to cancel because we were called home for an illness issue and they were very decent about it all. This time they "upgraded" us and it was really nice. Excellent hotel, quality and professional staff. On our most recent trip, it was also the best value. We stay at this particular hotel at every opportunity. There was a very good variety offered at breakfast and the quality was excellent. On a road trip home and trying to avoid cities(Champaign and Bloomington) we found the Best Western in Arcola, Il. Very easy access off the Interstate. Nice surprise. From appearances, we thought it was new, in actuality, it's 4 years old. Impeccably maintained. Front desk receptionist was very cordial and helpful. The breakfast was excellent with good hot and cold choices. The dining area is spotless and the attendant was very attentive. AND-a big deal for us-pet friendly. Back this way in Sept-we'll stay here again. "Very well run and clean hotel." I stay here every year the hotel is clean the staff is friendly and the breakfast is very good. We have never had any major issues and the staff always addresses any issue as soon as it it presented to them. "Perfect Stop Along the Way"
This is a new hotel, and it is beautifully designed and decorated. The room was large with plenty of space and creature comforts. A restful night's sleep was followed by a breakfast with lots of choices. We enjoyed the environment and appreciated the friendliness and helpfulness of the staff. The exterior of the hotel was new-looking as was the interior. Our room was very nice. Unfortunately, the interior of the rest of the hotel is already showing some neglect: the elevator was not as clean as it should have been, and spills on the carpet outside the elevator had not been cleaned. The breakfast food was not as good as I have experienced at other Best Western Hotels. It is little details that makes good great...with a little more attention, it would be excellent across the board. "Comfortable with nice views of the country"
Good sized rooms, comfortable beds, clean and quiet. Great breakfast. Yes, the rooms are dark, due to the brown/grey/beige color scheme. My only complaint is the elderly couple hovering over the breakfast this morning. Folks, you need to have some etiquette here-- this is not your home kitchen. Try cutting your grapefruit at your table instead of directly in front of the baked goods.. The old fella decided to bite into his muffin while waiting for his toast in the toaster. I saw him lick the tips of his fat disgusting fingers before pressing down on the toaster. Gross! (I made sure not to use the side of the toaster he touched.) Travelers, I recommend using the napkins provided before touching ANY of the containers, utinsels, toasters, etc. when you witness something like this. I realize this is not the hotel's fault, but worth mentioning for those who care about hygiene. Thank you for taking the time to write us a review. We truly appreciate it! We are so pleased you enjoyed our hotel. We apologize for the interesting breakfast guests you encountered. Hope you will stay with us again. The hotel is easily accessible from Interstate 57. Room was clean, beds were comfortable and breakfast was good. But the room was too dim even when we turned it to full light. Worst is on first night, the bath tub was clogged. Front desk said it was too late to find anyone to repair it. I had to choose not to shower after a day's driving or wade in dirty water to quickly shower. Disgusting grime floated from the drainage. It was fixed the next day, but for the bad experience of first night, there was no offer of any kind of compensation or good-will gesture. Excellent service, quiet room and comfortable bedding. Would definitely stay at this hotel again when visiting the area. Employees were friendly and helpful and room was clean. 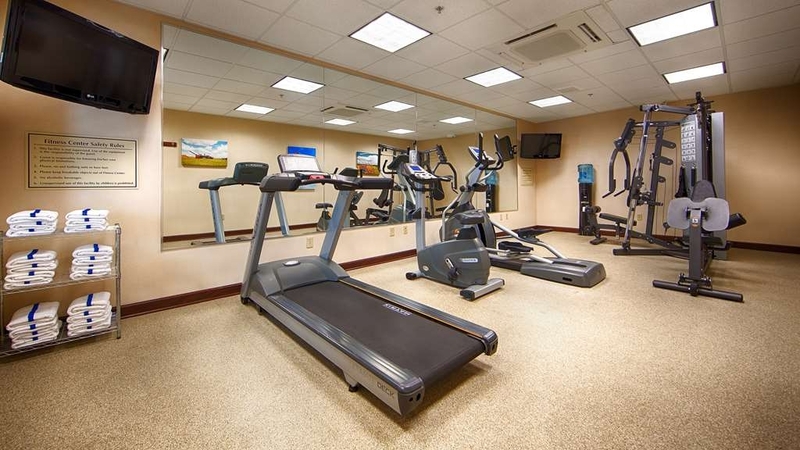 Indoor pool and fitness room were available for use. Thank you for taking the time to write us a review. We are pleased you enjoyed your stay with us. Look forward to having you stay with us again. I have found Best Western to be inconsistent as a chain. This location is one of the gems. Great, and I mean GREAT, staff. The rooms are large with comfortable beds. The amenities (pool, internet cafe, breakfast) were enjoyable and there is a fantastic Amish restaurant in driving distance. If I come even close to this location, I'll go out of my way to stay here. We really appreciate you writing us such a kind review. We are so glad you enjoyed your stay and we hope you get to our area again. We look forward to having you stay with us! This hotel is not in a highly populated area but it is worth staying at if you are anywhere close to thir location. This is a extremely clean hotel. We had a pet freindly room since we were traveling with our dog. Would recommend this hotel and would stay there again if traveling by their location. Thank you for taking the time to write us a review. We truly appreciate it. We look forward to having you stay with us again. The hotel was very clean, and the staff were very friendly and accommodating. The continental breakfast had a nice variety of items to choose from and the food was fresh. I would recommend this hotel for a short stay during travel. "Very nice hotel, great people working there"
We appreciate you taking the time to write us a review. We are glad you enjoyed our hotel. Hope to see you again soon. This is a wonderfully decorated hotel, close to the interstate and very nice. I go walking and I enjoyed walking around the area. The facilities were nice, such as breakfast area and exercise room. It is close to area attractions. Thank you so much for writing us such a nice review. We are so pleased you enjoyed your stay. Looking forward to having you stay with us again. Thank you! We appreciate you taking the time to write us a review. So glad you and your family had fun stay. We look forward to you staying with us in the future. New, clean, comfortable, beds, pillows and sheets top of line. One of the best hotel stays ever for the price. Tastefully decorated and good breakfast. Highly rexommend. Take a walk around town, cool brick streets and sidewalks. Thank you so much. We really appreciate you taking the time to write us such a lovely review. We are looking forward to having you stay with us again. The rooms were so clean and thoughtfully done. I really enjoyed the people and breakfast was very nice. We make this trip regularly and have never stopped in Arcola. Now that we know that Green Mill Village is such a gem, this will become a regular visit for us. This hotel is fantastic. Right off the highway - easy off/on. Very clean, great little breakfast area and food. Awesome service and hospitality from each and every staff member. The Front Desk is always accommodating and provide great customer service both in person or when calling for reservation. Will be back! We appreciate you taking the time to write us a review. Thank you for such a great one! We look forward to you staying with us again. Thank you for taking the time to write us such a nice review. We are so pleased you are a frequent guest of ours. We value your business. We look forward to having you stay with us in the future. We have stayed at this site 2-3 times. Staff is always pleasant. And the motel is clean. There is enough room in the parking lot to park a 24 ft horse trailer. We will always try to stay at here when we come to the area. We really appreciate you taking the time to write us a review. We are very pleased you have stayed with us a few times. We are looking forward to having you with us again in the future. This property is situated near the interstate but is quiet. It is clean and employees are very helpful. The morning breakfast is fresh and features an automatic pancake maker in an area just off the lobby. Rooms are large and clean with high quality furniture. Thank you for taking the time and writing us a review. We really appreciate it. Sounds like you had an enjoyable stay and we hope to see you again soon. we loved the pictures of the amish and the rooms were very spacious. also the bed was very comfortable and we also enjoyed the show the next night. the breakfast was wonderful and there was a little of everything. should not go away hungry. we only live about 30 miles from here but it was a very nice outing. it was for my 59 birthday. Happy Belated Birthday! We are glad to see you enjoy your stay with us. Hope you will stay with us again in the near future. Thank you for writing your review. We appreciate you taking the time to do so. "Local Amish crafsmanship in every room and throughout the facility.A pleasure to stay here"
Located in Illinois's only Amish community in the Amazing town of Arcola, a comfortable place to explore the murals of Arcola, the Raggedy Ann and Andy bronze statues, a train depot/information center and to eat some hardy food at the Dutch Kitchen or the fine dining of Daily Kneads (lunch only). There is even a Hippie Memorial. PLUS, the Green Mill Theatre - showing up and comers in good plays. There is not a better hotel in 100 miles radius. Thank you so much for taking the time to write this review. We really appreciate it! It really sounds like you enjoyed your stay in this area. We look forward to having you stay with us again. This is the best Best Western Hotel we have ever stayed in. It is very clean inside and out. The management cares about its customers and its property. We highly recommend this hotel.The value, the quality, the cleanliness and the location makes this hotel a great place to stay. Every year on our anniversary, My husband and I visit Springfield, IL for a 3 day car show. This year we were sadly disappointed by the show itself and the hotel even more. We were staying at a Hilton property and chose to leave and drive here-- Our home away from home. The place that never disappoints. The place where we feel happy and comfortable. The place where our friends Bruce and Jeremy are. We were greeted with hugs and every bad experience from the previous 2 days were erased. Since our last visit in July, this hotel has made many changes. The signage is being changed to represent the brand. The shampoos and conditioners are now all Pantene products. The minor maintenance issues have been corrected and this place is more beautiful than ever! This is the first time that we have had a king suite room, and it certainly didn't disappoint. It was huge! The sleeper sofa and living area were so nicely appointed. You could have had a couple with 2 kids stay spaciously in this room. The price was under $90 a night too. The pool was clean and immaculate when we arrived. We had the opportunity to spend many hours swimming, undisturbed by any other guests. This is one of my favorite hotels of all time and only 3 hours from my home. I will return time and time again, just to see the workers, my friends, Bruce and Jeremy. Nice rooms. We were in the banquet room and it was very nice also. Staff was very helpful. Breakfast was hot and was of good quality. We will stay there again. It is also close to a lot of cool shopping. "Very Nice room EVEN though we had pets." The room was very nice! Frequently, if you have pets, the rooms are sub par. This was one of the exceptions It is inconvenient to take care of the dogs on the 2nd or 3rd floor., so it was great to request the 1st floor and get it. The microwave, fridge and TV all working and looking relatively new. The staff were very polite and efficient. The motel looks nice in the front and back. I like that it is "off road" in a niche down a side road. The price was fair, and the breakfast was OK, and what you would expect for the price. We checked it out, but did not use it. The only kink was that the second day we had to get new card keys issued, even though we booked for 2 days. Overall, it was all good. Last of all, the heater/AC worked well and didn't rumble or clank when on. "wonderful clean new beautiful dog & people friendly"
we do alot of driving vacations and need dog friendly lodging. i like best westerns but this hotel is the BEST one we've ever stayed at. furniture i wanted to take home...friendly staff, super clean and comfy. full hot breakfast had options for everyone. i wish we visited this area more as i'd enjoy more nights here. you will be pleasantly pleased with this super plus hotel. Excellent hotel, very clean, comfortable with nice amenities. Their staff was extremely helpful. The hotel was easy to get to from the interstate. It had pretty fair pricing, It was close to attractions in the area. We will definitely will stay here again when in this area. The hotel staff is friendly and very helpful. The hotel appearance and cleanliness is top notch. The breakfast offered a wide variety and the food was good quality. Our overall stay was excellent. I would recommend this hotel to others. We have been to the Arcola, Arthur area before. We stayed at the BW this time and will make it our hotel for the area. The rooms were great and the employees went that one step over. Breakfast was complimenting and very nice. "Wonderful hospitality, great room, excellent breakfast!" Our check-in and check-out was done in a couple minutes. The front desk was really friendly and answered a couple questions I had about the area. Our room was lovely with a refrigerator, micro, great bath and shower. This would have been a definite five star except the four small squares for pillows, to me were not comfortable at all. It had me longing for a pillow from home. I did appreciate the good selection at breakfast and the nice breakfast dining area. With more comfortable pillows, I'd be all for staying here! Best Western motel in Arcola, IL is EXCELLENT!! Clean rooms, great service. Friendly people. Good breakfast. Comfortable beds. Quiet area. I will definitely stay there again if I travel through the area. My husband and I were pleasantly surprised by how nice this Best Western was! We stayed here for a wedding and the wedding reception was held at the banquet hall attached to the hotel. The lobby area is very nice and clean. Check in was extremely easy. We called to check in early (around 1pm) and they were very accommodating! Our actual room was nice, spacious and clean. We had a king size bed with mini fridge/bar. The bed was very comfortable. We couldn't hear anyone walk down the hallway or anyone next door to our room. It looked like they had a decent size continental breakfast but we wanted to get on the road so we skipped out on breakfast. The hotel did seem to be pretty busy, but there was ample parking available. I would stay here again in a heartbeat! If you are traveling to or thru Arcola, IL, the Best Western Plus is the place to stay! It is the cleanest place I've ever stay, rooms are well appointed and are very comfortable. The staff goes out of their way to make sure you are happy! We booked our stay a little late for family weekend at EIU so the closest hotel with availability was Best Western Plus. We're glad we booked late! From the exterior to the interior, the hotel was well maintained. Check in was a breeze. Got to our room, and we were so pleasantly surprised and how clean and nicely decorated the room was. Usually people have issues with the bathrooms at a hotel, but I must say, they bathroom was very clean and the most important...the water pressure in the shower was great! Overall, it was a great stay, and we will definitely be booking our next stay here. One of the nicest Best Westerns I've stayed in. Room was immaculate and quiet. Breakfast with cooked eggs and many other choices was far above other chains. Desk staff was very friendly and let me come back after checkout to print a boarding pass in the business center, since I had no other access to a printer. The only drawbacks (very minor) are a very limited choice of cable stations (no MSNBC, no mainstream HBO but a family HBO) and spotty wi-fi in the room. Arcola in general has limited cell phone access unless you're on Verizon. "Gem on the Prairie "
What a fabulous hotel. We stayed for two nights in this super clean hotel. I was surprised to learn that this facility is 4 years old, from the first step in the door it smelled brand new. Our king room was very spacious and tastefully decorated. The breakfast was amazing; prepared fresh daily they provided fried eggs, bacon, sausage, biscuits and gravy, fruit, muffins and a pancake machine. On the second morning they offered scrambled eggs and egg tortillas along with the other items. 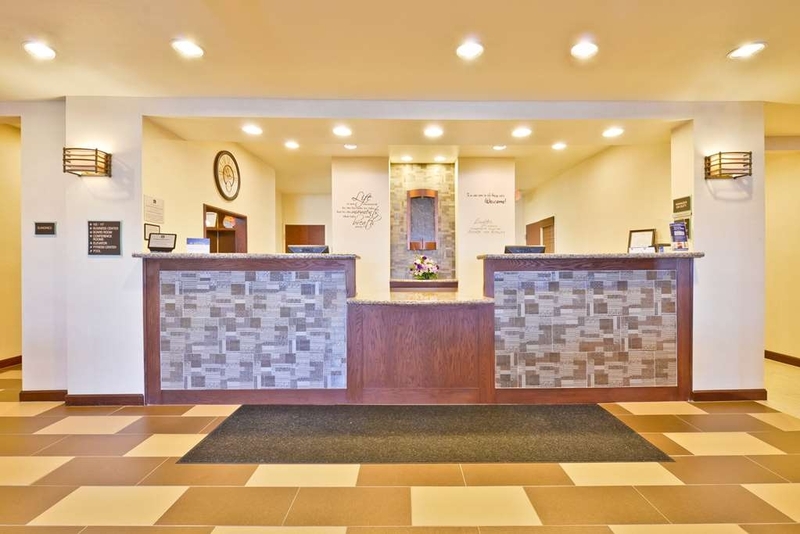 Front desk personnel were very pleasant and the entire facility is tastefully decorated and furnished with photos and furniture from the local Amish community. We were thrilled to find this gem out on the Prairie and will definitely return. Make sure you are aware of their 24 cancelation requirement when you book your room. Hilton and Holiday Inn allow you until 5;00 p.m. day of arrival to cancel your room. The room was nice but too many things can happen at the last minute that would cause you to want to cancel your room. If you cancel with in the 24 hours of your arrival you will still get charged for the stay. In a long road trip, staying mainly at Best Westerns, this was the best. Facility four years old, clean and up to date, not a bad price. Located in a rural area. Best breakfast, with chopped ham, bacon and sausage links, eggs plain and with onions and peppers, other usual stuff, but nicely presented and fresh. Internet works. Only minor complaint is the bathroom lights, which are not bright and cast a sickly glow on skin. Also, watch carefully for the turn into the motel property. I turned twice into what looked like entries but ended in grass. I would definitely stay here again. Very clean, new hotel. Nicely appointed and modern amenities. Comfy bed. HDTV. Decent fitness center but with more budget model equipment. Worked fine though. Decent hot breakfast items. Did not use the pool. The wireless internet was pretty poor in the room but worked reasonably well in the lobby. Geeks who carry a LAN cable could plug in save themselves from the misery of the poor wireless connection. "Won't consider any other hotel when in this area!" Out of all the hotels that I have stayed in, over many years, this one is the best. I have nothing but good things to say about this hotel. Despite the hotel being about 30 minutes from the University of Illinois, this hotel will be only only option when looking into hotels for future trips to sporting events at the University. Whenever we travel to the Champaign-Urbana area, we make sure to stay at the Best Western Plus in Arcola. It may be 30 miles out, but well worth the car ride. The hotel is very nicely decorated and clean. The staff is always pleasant and efficient . They serve a full, hot breakfast every morning. The beds are very comfortable and the rooms are nice and quiet. I highly recommend this Best Western. Thank you so much for leaving us a review. We appreciate you driving out of your way to stay with us! We look forward to your next visit. This is always our stop when traveling I-57. This hotel is always clean and comfortable. Jeremy at the front desk does a good job. There is plenty of parking. The hotel is right off the interstate yet has a rural setting. You do need to drive into Arcola for meals-or go to Arthur which is a beautiful Amish area just nine miles away. Breakfast is good. There are hot items and cold items. The room is comfortable and the hotel is clean. The price is right. Thank you for taking time to write a review for us. We are glad that you enjoyed your stay. Please stop in again if you're in the area. "You should try this place." We have now stayed here three times. Every time we have been here, everything was VERY GOOD. Room was spacious, breakfast was good, beds were comfortable and everything was very clean. The front desk people and the kitchen lady were all very nice. We strongly recommend this Hotel. It really is a hidden hotel for the area. If you have business in Charleston, check it out. It is only about 25 minutes from there. Oh, prices very reasonable too. Thank you for the amazing review. I am happy to hear that you enjoyed the breakfast. We have made some changes in response to guest reviews and we really think it's great. Please stop in and see us the next time you're in town! The hotel looked new. It was four years old. The room had modern decor. Staff was very friendly and helpful. Very clean. Extremely comfortable beds. High speed internet. The breakfast was excellent, with great variety. Thank you for writing us a review. We are happy to hear that you enjoyed the décor. The furniture in the rooms is hand made Amish furniture that was all done locally. The artwork throughout the hotel is also from a local artist. We are very proud to be able to share the local culture with our guests. Thank you again, for the review. We hope to see you again soon. It was so peaceful and quiet. The entire staff was so kind and helpful. If am ever in the area again I will be staying here. Everything we needed and asked for we received help with. I truly enjoyed myself for the two days that we were there. Just wish I had more time to visit the lovely country view. The indoor pool was also a plus and they had a gym. The rooms were clean , it was very quiet. It is the perfect place to hold a business meeting. Thanks for leaving us such a great review. We are pleased to hear that you enjoyed yourself and were able to relax. Please come back and see us again soon! My wife and I spent a night at this hotel in the heart of Illinois' farm/Amish country. What a nice place. Everything was clean and comfortable, the staff was just as friendly as they could be. The room was quiet despite being next to the ice machine, never heard a sound from the outside. Breakfast was one of the best I've ever had at a hotel, they provided the makings for a breakfast burrito among the other hot/cold items one would expect. Most highly recommended! The hotel was so clean and beautiful our family thought was brand new! The lobby and rooms are nice and more sound proof than most hotels. Pet friendly was another advantage for us. Loved the room set up! With corn fields in every direction in the middle of Amish country sits a great newer Best Western hotel. Try it, you'll love it and it's under $100! Very good free breakfast and only 8 miles from Yoders' restaurant in Arthur makes this a great stop. We just needed a place to sleep on our way back home, so didn't want to spend a lot of money. Wow, what a surprise to find this hotel on the road. Rooms were spacious, clean and quiet. There was a wedding going on and was still extremely quiet. Great hot breakfast in the morning. Staff was very friendly. "Nice amenities, but basic problems "
Hotel is just a couple years old, so things feel nice in general. Room is spacious and bed is comfortable. There's room to put luggage on dresser and bench and lots of counter space in bathroom. Really nice furniture, except the desk chair tips back way too far. Room door doesn't latch on its own, only if we close it hard. Five nice pillows and four of each size of new, bright white towels. Entire building is clean with exception of air in guest room. Our room smells damp and unpleasant upon entry, not so noticeable after a few minutes. We travel with a pet, so maybe this is a specific pet room and this is a smell left behind by a previous pet. The air conditioner cools the room but air still feels damp. Air blows directly on the bed, can't adjust the direction of airflow. The temperature gets pretty warm before air conditioner kicks in, so big temperature fluctuations throughout night. Purpose-built breakfast area is efficient and has quite a few small tables. Breakfast choices are good, including fruit (bananas, oranges, grapefruit), yogurt (with and without artificial sweeteners), tasty cinnamon rolls, and a cool make-your-own pancake machine (just push a button). Breakfast is maintained well by two people at a time. Pets are allowed and there's a specific grassy place to take dogs. There's a coin-operated washer and dryer for guest use. We would probably stay here again, but not go out of our way. This was great place to stay on way back from Mother Angelica Shrine in Cullman Al . Was a great deal and experience. The King Suite was awesome and Breakfast was one of the Best we had on our trip. They have the coolest pancake maker and the Blue berry Muffins were great. This hotel could be a Premier. Thanks so much for leaving us a review. I'm sorry to hear that you were less than happy with your experience. I personally did not speak to you, so I'm not sure whom you are referring to as the manager. However, the convention center contract that is signed by wedding parties states: "We will leave extra trash bags, toilet tissue, and paper towels for you to use during your event. There will not be a staff member on duty to tend to these things, so you will be responsible for tending to them." We have been having weddings for the three years that we've been open and never had any complaints. You are correct in saying that it should be an honor to have these events. We love having them and we love meeting everyone's families in the process. Again, I'm very sorry that you were unhappy, and I'm not sure whom you spoke with that you felt was rude, but I will talk with the staff. Thanks again for your review. A business trip brought me to Arcola and based on my customer's recommendation, I booked two nights at the Best Western. I had a wonderful hotel experience from arrival to departure. The even offered me a snack bag with bottled water...and a cookie at check-in! Hotel is new, the rooms are clean, spacious and beautifully decorated. The bed was super comfortable, breakfast was delicious. And last but not least, the employees were very welcoming! If i'm ever back in Arcola I'll stay at the Best Western! Thanks for the amazing review! We hope you come back again soon! On the east side of I-57, so did not notice right away, but it popped up when looking for a room in the area. Rooms are nicely sized, comfortable. Staff is friendly and helpful. Theatre in the building offers up some plays. Downside was lack of food in hotel and in area. Hotel is working on adding restaurant and plays now come as dinner theatre. After 7 p.m., food offerings quite limited in area. Missed out on breakfast, but believe continental is offered. Thank you for the review. I'm very sorry that your missed out on breakfast. We have some amazing options to choose from, so I hope that next time you get to grab breakfast before you leave. Hope to see you again soon. "Great stay at a great value"
The lobby created a positive impression when you first walk in and it gets even better when you walk into the spotless attractive room. Well worth the small amount to upgrade to a suite. Friendly, helpful staff. Great value, especially compared to accommodations just a few miles down the road. Easy access from the highway. Only negative isn't their fault -- good eating choices are a few miles down the road. Will definitely stay here again. Thanks for taking time to write us a review. We are so glad that you enjoyed your stay. We are glad you loved the lobby as much as we do. We feel honored to be able to come to work in such a beautiful building everyday. Please come back again soon! 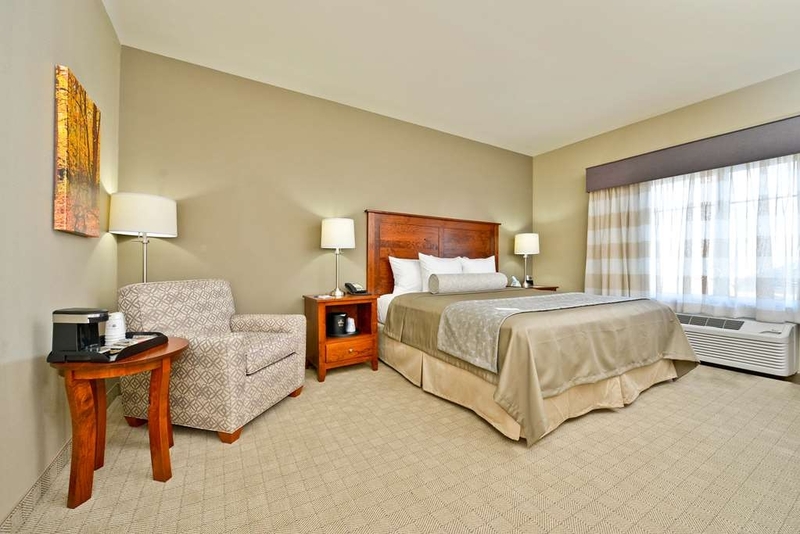 "Very nice hotel and a great value"
This hotel is very new and right by the I-57 exit ramp. Our room had 2 Queen beds and was more spacious than most rooms we've stayed with a similar configuration. The breakfast was included and was pretty standard fare. We'd definitely stay again, if we needed to be in that part of the State. Thank you for the review. We hope you come back again to see us. We have some great festivals coming up in September, if you're looking for a good reason to visit. Just passing through, stopped here because the fares were good and the reviews were solid. Quality was comparable with $120/ nite establishments. At $87/ night this was great value, very clean and the rooms were larger than comparable establishments. We left early in the morning ( 4am) staff had prepared a to go breakfast bag and hot coffee was available at 4am. Staff was awesome. If I'm in this area again I will be booking here again. When I see best western I usually skip it but this place had great reviews so we decided to try it. It was great. Unfortunately we didn't stay long enough to use all of the amenities. The rooms were really big and clean. The staff was super helpful and they had free coffee and cookies. We stayed in several hotels this trip and I wish we had stayed here instead of some of the others. The price was right too $87. I would definitely recommend it. I love this hotel! Never, in over 20 years of travel, Have I ever met a kinder or more considerate staff. My husband and I just stayed here July 2-4 to attend the Arthur Freedom Celebration a few miles down the road. I had booked this hotel many weeks earlier and had qualified for a special rate discount for being an Access member through IEA/NEA. Shocking to us, due to our last stay, We were not acknowledged in the slightest at check-in. Having stayed here before, I knew that this staff was sweet, welcoming, friendly and happy to see you. This time, The young girl behind the counter was on the phone and proceeded to finish her phone call before she abruptly checked us in. She questioned the "weird" rate code that I booked under, and then handed us our keys. She never smiled, welcomed us back or treated us as valued guests. This was disheartening. We took a few minutes to explore the hotel, to see if anything had changed from our last visit. Happy to see that it was just as welcoming and homey as it was last time, we proceeded to our King suite. Upon opening the door, The first thing that I noticed was the fact that this was a regular room, not a suite. Since we had seen the weather forecast for the area, we purposely booked the suite since we knew we would be trapped in the hotel because of forecasted heavy rain and thunderstorms on the second day of our stay. We checked the room for cleanliness and then went right back downstairs to talk to the young woman who had checked us in. I explained that I had booked a suite and this room was not what I reserved. She took a few minutes trying to understand what her computer was showing her, while I pulled up my reservation online on my phone and showed her. She bluntly said that due to a fire at the assisted living home directly next door to this hotel, many of those residents were staying at this hotel. Since my king suite also had a roll-in shower, it was given to one of the residents. I was appalled at the bluntness in which this message was relayed to me. There were no apologies, no offer to move us to a different room if one became available, no price adjustment. I had to ask her to adjust my nightly rate since I was paying for a suite and she said that due to that "weird" rate promo she wasn't sure if she could change rates manually. Luckily, another older woman heard the conversation and guided her through it. She adjusted my rate down $10 a night. After adjusting my rate, She picked up the ringing phone on the counter and I actually had to ask her if she was done with us and dismissing us. That customer service was beyond pathetic and not what this hotel is about. I quickly asked her if my buddy, Bruce (That I met from my last stay ) was working that particular day, and luckily he was! Even though this was one of the rudest check-in's we've ever had, Bruce made up for it later that night by being his usual, sweetheart self. Even though tired from being up since 3am in the morning, We stayed awake long enough to see Bruce come on shift at Midnight. He greeted us with warm handshakes, a smile that could save the world, and talked to us like he knew us for years! He checked many times to see if we needed anything, if we were okay, and if he could be of service in any way. This is the sort of hospitality that goes above and beyond what anybody expects. Bruce is genuine and truly wants to please people. It was like seeing Santa Claus- I just could not stop smiling talking to this beautiful man! Regardless of my check in, I felt back at home again talking to Bruce. Even now, I still smile thinking about our encounter. For this reason, I will be rebooking very soon. That feeling of being safe, welcome and cared about is so personal, that I would pay double the room rate just to feel that way. Bruce is an asset to any establishment he chooses to work for and people will come just for him, and his presence. The world would be a lot better of a place with more people like sweet, honest Bruce in it. During our second night, we were rained in as predicted. Since we were confined to the hotel and lacking a suite, We took up residence in the closed breakfast area. This is when we really got to know, Jeremy, at the front desk. Jeremy was previously mentioned in last year's review only as the night manager, but I assure you that he is much more than that. We sat for 7-8 hours in that breakfast area, watching everything that was going on around us. We had seen guests come to the counter for pool towels, look through the breakfast area for plates and search the empty cookie container for a treat. As soon as Jeremy came on shift, he was like a machine! He immediately went and filled the pool towels, he started fresh cookies, he tidied the area. This kid did not stop moving for a second! If he stepped away and the phone rang, he ran for it! I had not had a personal conversation with Jeremy during my previous stay, so I was happy to hear that he's a hard working, family man with a little boy of his own. Jeremy is another asset to this hotel, and someone that will bend over backwards to make sure his guests are satisfied. I only wish management had the opportunity to sit for as long as we did, and really evaluate their staff. This kid works harder than anyone else we saw! Jeremy makes me want to come back, as he was a highlight of our trip. As you can see, the disrespectful anomaly that we encountered at check-in is not the norm for this hotel. Situated in the heart of Amish town, This hotel oozes the southern charm and hospitality that I adore and appreciate. This charm will keep me coming back time and time again. The hotel itself is newer, but starting to show a little wear. Maintenance is lacking and some little issues, if not corrected, will result in major issues down the road. The front bricks are falling off of the building in many spots. It seems to be happening in the 4th or 5th row of bricks (Up from the bottom), and it's all over the building. We saw this in the front of the hotel next to the main door, on the pillar of the drive, and also in back, outside of the pool and next to the assisted living's firepit. There is cracked tile immediately inside the front door. The pool has some discoloring that needs to be scrubbed off, both on the stairs and on the walls. The retention pond in back needs the debris cleared and trash thrown away. Surprisingly though, the rooms are still just as immaculate as they were last year. I would recommend this hotel to every single person if I knew that either Jeremy or Bruce would be checking them in. This hotel is safe, beautiful, newer, clean, affordable, quaint, homey and comfortable. I am trying to debate how many trips I can make back there this year! Regardless, I will definitely be back soon! Extremely clean and quiet. Beds were very comfortable. Staff was courteous and helpful. A well maintained hotel; it's either brand-spanking new, or someone knows how to keep up appearances! Parking lot was very large and well lit. Kids loved the swimming pool. It wasn't huge, but adequate, clean and well-kept. Will definitely stay there again next time we're in Arcola/Arthur area. "Very Clean Hotel with Great Beds"
I booked a group of hotel rooms for a softball tournament at the Best Western in Arcola. It was an extremely clean hotel. It smelled new as if it was just built. The beds were amazingly comfortable. It is hard to satisfy a group when booking a hotel and every parent loved this hotel so it made my job as a team manager easy. I would recommend staying at this hotel if you are in the area. You won't be disappointed. This is a very clean and well-maintained hotel. Not many options to choose from in Arcola, IL, so this was a very pleasant surprise! We stayed in a Queen Suite with two double beds and a pull-out couch. The TV in the room is huge and the room was spotless. Staff was attentive and friendly. Breakfast had a good selection of items, but our kids were disappointed that the pancake maker was out of service. This would of been a nice change from the standard waffle maker at most hotels. The swimming pool is clean, but very small. A jacuzzi would be a great addition to the pool area. Overall, this is a fantastic hotel that is a step above many Best Westerns I've stayed at. This hotel is also very handicap accessible. "Best... hotel... ever - perfect for fam of 7"
Is it in the middle of nowhere? Yep! Is it the most peaceful hotel we've ever stayed in? You betcha. These folk are awesome. The hotel is beautiful. And they use real eggs in the breakfast. It's so wonderful. The staff are kind, playful and so good to my wife and I and our kids. The rooms are huge and ACTUALLY accommodate a family of our size. We're excited because we'll be there again in a few weeks for a performance we have nearby. "Girls Road Trip Arcola IL"
This hotel is spot on not one issue, kind engaging employees absolutely spotless hotel. Wonderful service from the time you are greeted at check in as well as all staff including the caretakers of the Inn. Breakfast was a good combination of Hot and cold items fresh and kept clean and re-filled. Clean rooms and a great pool for everyone of all ages! Awesome customer service...all employees were nice and accommodating! The location was close for anyone visiting the Amish in Arthur, IL. Good overall value! Excellent overall accommodation. Friendly staff. Helpful. Extremely CLEAN. This is a huge plus for me. I was comfortable walking around my room in bare feet! Staff went out of there way to answer questions. We were there with a group of teenage boys who were participating in the State Track Meet. Those boys were treated with respect, too. WE traveled to Champaign Urbana for a graduation and all the hotels were sold out. We are glad we traveled the extra miles to stay at this hotel. It was new, clean and comfortable. The breakfast was good and a nice way to begin a busy day. This hotel was an exceptional bargain. It is a new facility. The room was very spacious and bed was comfortable. Staff were friendly and helpful. One of the best hotel breakfasts that I have had. A great place to stop in the middle of Illinois. "Warm Friendly Staff and Cozy Homey Feel"
Super, Super friendly service. We were greeted so warmly when we first arrived! Such a wonderful welcome! I would also like to mention that we stayed on an excessively busy weekend and need to keep changing our reservations (We had multiple rooms.) They were so nice and accommodating with all our changes. Our rooms were mostly clean and ready when we arrived. Loved the decor, especially through out the hallways. The breakfast was GREAT! The blueberry muffins smelled amazing. When I mentioned this, the lady taking care of the buffet whispered to me that they were Sara Lee. They had homemade apple butter and salsa from local farms. I tried the apple butter and it was the best I have ever had! Even on a busy weekend they were able to keep the buffet well stocked. We really appreciated their attention to this. The fitness center is little more than a machine or two but was certainly better than nothing. The one downer of our visit was that didn't have enough staff to handle cleaning the rooms on the high occupancy weekend. We were gone from early in the morning to about 3:30 in the afternoon. The maids never got to our rooms. This was kind of a downer. Thank you so much for taking time to write us a review. We've recently changed some breakfast items and the muffins are one of our new items, so I'm thrilled to hear that you liked them. I apologize for your housekeeping issue. I had checked into a couple of rooms that didn't get done and the "do not disturb" sign was left on the door. When this happens, we do not go into the rooms. I'm not sure if yours was one of these or not, but I will bring it up with housekeeping. We hope that you'll stop in and see us again the next time that you're in the area. If you need accommodations near Champaign/Urbana IL this is a nice find! About a 30 minute drive from campus this was nearest available for dates we needed to attend graduation. So glad we stayed here, it was very clean, they have a great indoor pool and a nice workout room. The breakfast was a definite plus and the staff was efficient and friendly. Did I mention this was a very CLEAN hotel! Furnishings are local Amish crafted and quite nice, you won't be disappointed. Thank you so much for the amazing review. We hope to see you again soon. "I love Best Western hotels." I like to stay at Best Western hotels because it is just like home. You have a healthy breakfast choice or not. There is a work out room. The rooms are very nice, the bed is comfortable and private. There is plenty of room. There are amenities available if you forgot yours. The people that work there are very nice and very helpful. We appreciate you taking time to leave us a review. We are very happy to hear that you enjoyed your stay! "This hotel gets it right"
We always stay at this hotel when traveling I-57. The parking lot is spacious and we like the rural setting. You do need to drive to a restaurant to eat. The rooms are very comfortable. The TV remote is easy to use. The bed is comfortable. The rooms are attractive with Amish made furniture which is sturdy. We did not have breakfast this trip but it is provided. The price is right for such a nice hotel. Thank you so much for writing us a review. We are so happy that you choose to stay with us when you're traveling through! We hope to see you again soon. This was a beautiful, spotless motel! Upon walking into the lobby you could tell this was a well taken care of motel. It still smelled new even! The lady at the desk got us checked in and was very nice. When I brought the cart back down she made sure our room was ok while she was sweeping the floor (which by the way didn't look like there was much dirt) Comfortable beds, large suite with 2 queen beds and a sleeper sofa. Good breakfast that included bisquits, gravy, scrambled eggs, bacon, pancakes and your usual cereal, yogurt and pastries. Milk, juices and coffee too were available. The lady was great at keeping it stocked and clean she was very friendly as well. Check out was easy and quick however I really wasn't ready to leave :-) Thank you for a wonderful stay! Would love to go back and try the pool and visit the area. Thank you so much for your amazing review. We hope you stop in and see us again. "A gem in the countryside!" This property got rave reviews and it held up to them all the way from the beginning of our stay until we were out the door. Our king suite was clean, neat, welcoming and large enough to really spread out. The bed was amazing, clean and even the mattress had a protective covering. The shower had plenty of pressure and the bathroom was clean as can be. The breakfast buffet is normal except the room and the food was well kept, clean and neat. Plenty of parking and a cozy lobby to welcome you. This is a gem of a property! This hotel is pretty much brand new. It was a lovely hotel with a great breakfast in the morning. It was clean and the staff was very friendly. My only complaint would be that the pool closed fairly early compared to other hotels we have stayed at and they staff was in at one minute after to tell us to get out of the pool area. I would stay at this hotel again in the future. "Best Western Plus In Arcola"
The hotel was very accommodating with our early morning arrival and the staff was available to let us in. The hotel is vey safe and clean. Like the idea that it is a green hotel. Rooms are very comfortable and clean. At breakfast there was a variety of foods to choose from and the staff ensured there was always enough. Had a nice stay. This hotel is very clean & is well maintained. The staff is very friendly & helpful. Free breakfast is decent. The only negative thing I have to say is that the rooms are not very sound proof. Noisy pipes in the wall, and I could hear everything from the room next door & above us. Overall a good experience though. Very clean & comfortable! "Spacious Rooms - Comfortable & Clean"
TH 3/31/2016. Arrived late afternoon after battling rain, wind, & traffic for 8 hrs. "Best Western Plus" is easy to get to from the interstate. Grounds of the hotel were clean. It is in a nice quiet area. Desk staff was very professional, helpful, & friendly. Check in was quick & professional. Our room (Rm #112) was spacious & clean, had a large bathroom, and, had very comfortable beds & furnishings. It has a nice sized TV (42"?). WiFi internet access was easy & strong connection. Breakfast was very nice and contained a good selection of items. Dining area is also spacious to accommodate guests. We reported one downfall to Rm#112 ... There was loud water noise from a drain pipe line in the wall of the bathroom (Bedroom side). Heard it for a short time at 10PM ... then woke to that noise @ 5:45 am. Reported the incidents to the desk. Outside of that ... the stay was a very pleasant & comfortable stay. Would stay again ... but not in #112. Very nice hotel!! Welcoming front desk. Staff was friendly, rooms were nice and big as well as clean. The free breakfast was one of the best hot breakfasts I have ever seen offered before.Pool is small. Free hot cookies were enjoyed by my kids! We were on a road trip and needed a place to stay over night. The staff was very helpful and the room was great. We went and ate down the road and had good bar food. We will come back and stay here again on our way home. We will look for other best westerns on our way down south. Love this place! Only had a couple issues on Wine night- never having the wine we wanted on the menu. But, the food has always been perfect. The pasta is our FAVORITE! The bruschetta is amazing as well! "Check Out the Photo Art"
We were very pleased with our recent stay at this Best Western Plus. It is new, welcoming and very reasonable. I enjoyed the pool. Breakfast was great. Do check out the photo art on the walls going to your room. Overall, the whole place was well put together. very clean hotel. Nice beds. Breakfast was very hot. Nice assortment of items. Staff very friendly. a bit farther than we thought to Champaign but traffic was good. probably a 40 minute drive to Assembly Hall. "This is a WONDERFUL Hotel"
My 9 yr old son and I were in Arcola for a competition and stayed at this hotel on 2/15/2016. It was a great experience. The hotel is lovely, with all handmade furniture and pictures. At checkin, they had fresh cookies, and a goodie bag for my son. They also let us know that his friends were already swimming in the pool. The room was very clean, and had a minifridge and microwave. I loved the bed and the fluffy pillows. My son thought it was cool that they had "earplugs" near the shampoos. We didn't use them, but it was a nice touch. We went swimming for an hour or so, and the pool area was very clean, and my son loved the pool. For an indoor pool, it was not super "chlorine" smelling. Their breakfast area is larger than I am used to. On our day (The menu changes slightly every day) they had biscuits,cheese, sausage, bacon, and eggs, to make your own breakfast biscuits. My son loved the pancake maker. they also had yogurt, milk, coffee, apple and orange juice, donuts, pastries, oatmeal, and topping for the oatmeal and yogurt. It was all very clean and nicely laid out. Everyone that we met at this hotel was very gracious, and you can tell that they take great pride in what they do. I would not hesitate to stay here again. It was a wonderful place to stay. Stayed here for a birthday party and had a great time! Hotel is extremely clean - kids loved the pool and we made great use of the conference center which was awesome as well. Beds were very comfortable and the internet worked well despite being in the middle of nowhere. Had no idea this place even existed until being invited by friends. Pleasantly surprised! Our accomodations was excellent.We had been to Elkhart to get three motor homes from the factory and bring back to our dealership in Mineola Texas and there was plenty of room for us to park our vehicles in the parking lot. The staff at this hotel was very efficient and coujrteous. We will be staying here again on our trips to the factory. "One of the nicest places I have stayed in Central Illinois"
Newer hotel, still seemed like it had that shiny new hotel look. Great service, spacious lobby when I had to wait for other members of my team. Breakfast was as expected at the Best western. This means it was a simple filling breakfast what is needed with a full day of work ahead of me. Room big, bed very comfortable. Shower great water pressure. All rooms have mini fridge and microwave. It was great for late night popcorn while watching a movie in my room. Good strong wifi signal did not get dropped once while on VPN for work. We usually stay at the hotel across the highway, but they have irritated me too much the last few stays.This is a newer hotel and thought we would give it a shot since other family was staying there as well. It is very clean, staff was very friendly, breakfast was delicious and there were many options! I always saw a member of staff doing something unlike other hotels where you can't seem to find them unless they are cleaning the rooms. The hotel was very inviting and the rooms were spacious. Will definitely stay here again! This hotel had everything I needed. Comfortable bed, good amenities, excellent service. Internet and TV were excellent. Nothing fancy, but totally solid, good experience. The staff was polite, helpful, and very courteous. Breakfast was good. I highly recommend this hotel if you are staying in this area. 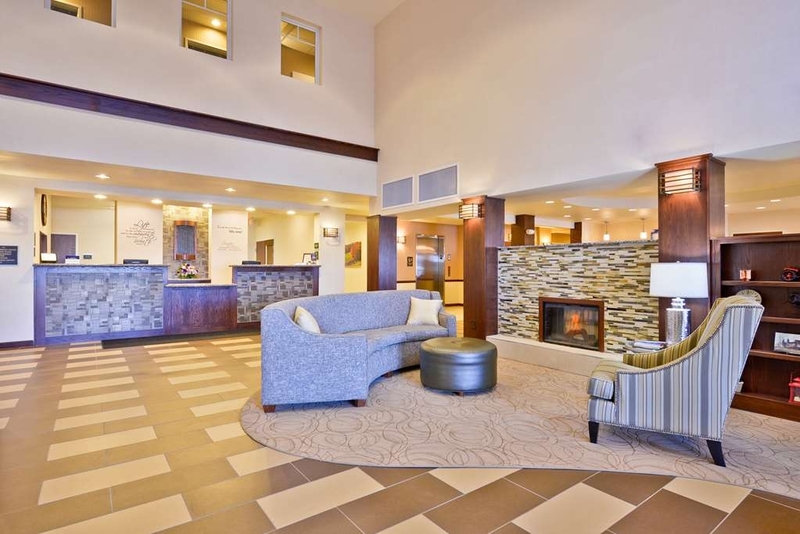 This is one of the best, most updated and new Best Western Hotels I have stayed in. Definitely the best in the 25 mile area. Breakfast was better than average....Great Staff as well. Local made, High end Furniture in rooms is an added plus. What a wonderful hotel, I would give you a 4 star rating if I could. Everything was perfect, very comfortable stay! The room was very spacious and clean. The internet was extremely fast which is a plus for business travelers. Breakfast started at 6:30, plenty early. There was a nice mix of cold and hot items, two different egg options. This was my second stay and I will definitely book here again when I head into town for the Arthur, IL CIWE woodworking show. "Best stay, best prices, close to family"
We stayed here for the second time over Thanksgiving week this year and loved it again! 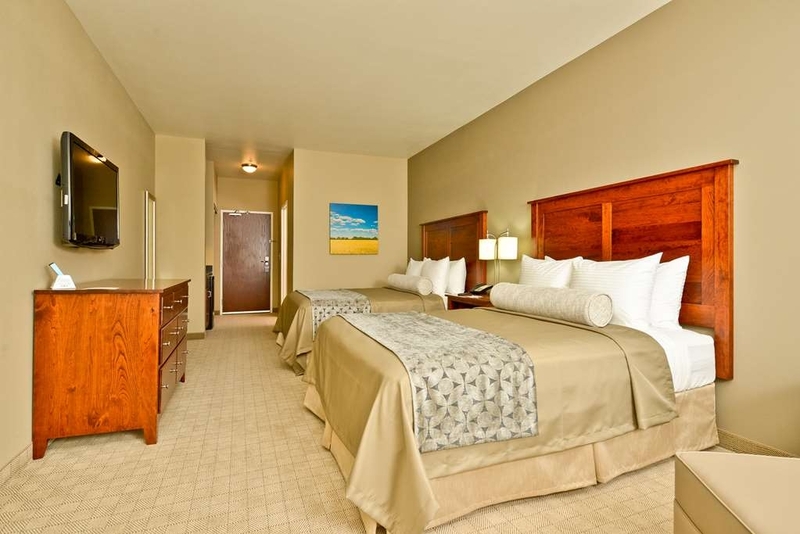 Not only were the accommodations clean and new-feeling, but the staff was always pleasant. The great quality breakfast is a nice bonus, too! We were consistently impressed with that. We got a really great deal through Priceline. The only downside to Priceline is that they automatically book a double queen room. It is me, my wife, and our one year old traveling, so that wouldn't be optimal. In order to change it to a king we had to call Priceline and ask them to call the hotel to make a change to the reservation, which Priceline was happy to do. We also really appreciated the staff working over Thanksgiving so that we could have a wonderful trip visiting our family. Offered me a discount to enroll in rewards program but the next day said I didn't couldn't have it even though they enrolled me without any problems. Otherwise the stay was okay except that the breakfast was pretty tasteless and the breakfast staff was grouchy. I was surprised to find such a high quality hotel in Arcola. Let's face it, it's in the absolute middle of nowhere. I stayed for two nights to attend a funeral. Very clean and well appointed. The only negative I have is true for most BW+. They have a great selection for breakfast, but some of the offerings are very obviously frozen/microwave food and taste just awful. The eggs are like rubber pucks and the biscuits are rock hard. "Best Place to rest your head in Arthur, IL"
This hotel IS THE BEST place to stay when visiting Arthur. It is clean both in and out and the staff is A++++. They will go above and beyond to help you with your reservation and make your stay an enjoyable one. We have stayed here quite a few times and will not stay anywhere else when we are in town. Keep doing what you are doing! The hotel was very clean and nicely kept. The service was great. The room was nice and the bed was comfortable. There were even free warm cookies at check-in. Great place to stay. I would stay again and would recommend this place for others to stay too. Rooms were comfortable and roomy. Microwave, fridge and comfortable chair with ottoman. We stayed for three nights on family trip. Hot breakfast foods weren't the best but that didn't effect my review. Rooms were excellent and hotel is right off the highway. Very convenient to Champaign and other towns. Thank you for choosing our hotel for your trip and thank you for taking time to write a review for us about your stay. We are very happy to hear that you enjoyed your time with us. We hope to see you again soon! Very comfortable and clean. Would love to know the brand of mattress and pillows! Slept very well! Indoor pool was a plus. Breakfast was fresh and,plenty to choose from. Right off the highway, easy in and out. Thank you so much for the wonderful review. If you stop in again, come by the desk and we'll be more than happy to talk about the mattresses and pillows with you. Thanks for choosing our hotel! This hotel was very clean and new. Breakfast was delicious! We attended a play at the hotel, which was so well-performed! This was a great place to stay for our party of 5 people, in 2 rooms. Loved the convenience of the location. It was easy for us to get to local restaurants and shops. Had a great stay! We are so happy that you enjoyed the stay. Thank you for you comments on the breakfast. We are always interested in the guest feedback. We hope you will stop in again if you're in the area. This Best Western was the best of the Best Western hotels we have stayed at. The staff was extremely helpful and the breakfast was very good. I would recommend this hotel. It was very clean and the supply of shampoo conditioner lotion make up remover, they thought of everything. Thank you so very much for the review. We love being called the "best of the Best Westerns"!! We are fortunate to have a staff that enjoys working here and enjoys meeting all of our guests. We make it our priority to do everything we can to make sure that everyone's stay is amazing. We really hope that you'll stop in again if you're in the area. The hotel is clean and new! Fresh baked cookies on the counter. The beds are awesome! Our room was large and very comfortable. We saw the play "Stitches" on property and had the dinner package...what a deal and great performance! The only 2 slight criticisms would be there is no hot tub in the pool area and breakfast was a little disappointing. The eggs were overcooked and the hash browns under cooked but the pancake dispenser was super cool! Would definitely stay here again! "beautiful decor, especially wall art in public areas and guest rooms"
The furniture was also good quality in the hotel. Everything was clean. Breakfast was good. The only improvement would have been a nearby restaurant for lunch or dinner. Good location to highway access. Quiet. You will not go wrong in staying here. 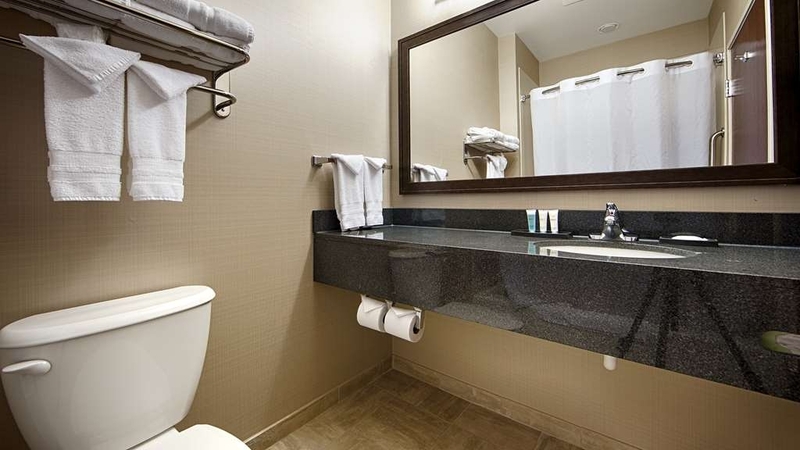 This hotel goes the extra mile in amenities and great staff at a nice price. We used this hotel as our anchor while exploring the area. We loved coming back each evening. I chose this hotel while I visited my son at Eastern Illinois University. This hotel is about a 25 min drive to the school but because closer hotels were sold out this was our destination. The overall hotel is nice. We stayed in a handicapped room on the first floor. The room was clean with comfortable beds, a pull out sofa, mini fridge and microwave. The bathroom was accommodating for a wheelchair. Our room was at the end of the hall with a side door entrace/exit. This was convenient in assessing our van through the side door instead of going through the lobby. The hotel provide daily continental breakfast. It was okay, I've had better. Housekeeping staff were very nice and willing to assist or just have a general conversation. Overall our stay was good. More than what we expected. Spacious rooms. Very clean. Staff are wonderful. Pets allowed if they are 30 pounds or less. Plenty of outlets to charge phones, tablets or whatever. Breakfast selection was great. Fantastic staff, cleanly. Very helpful, understanding, accomodationg. Had 4 rooms booked and they set them up very close to each other. Dis all I asked of them. One minor problem with tv was fixed instantly. Thank you for taking time to leave us a review. We are glad that you and your friends and family enjoyed your stay with us and we appreciate your feedback. We hope you'll come back and stay with us again soon. You will never regret staying at this awesome hotel.It is very restful and relaxing.The decorating is wonderful. Easy on and off the freeway. I walked the halls looking at all of the beautiful art, pictures of the amish farmers and landscape. Thank you so much for taking time to leave us a review. We are happy to hear that you enjoyed the hotel and the artwork. The artwork was done by a local artist and I think it's amazing myself. I still notice new things in the photographs as I'm walking the halls. We hope that you'll stay with us again if you're coming through Arcola. 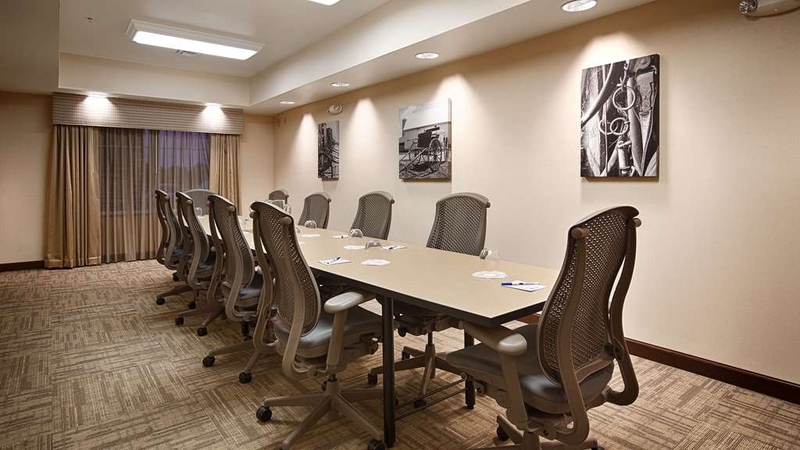 "Terrific Staff and great location for EIU events"
We recently stayed at the Best Western Plus Green Mill Village in Arcola, Illinois for an Eastern Illinois University Family weekend event. The facility was wonderful and accommodating as well as a terrific value. The location was conveniently located off of I-57 and allowed for a fast commute to EIU in Charleston. The rooms were beautiful and clean. The staff was courteous and considerate. I would return and stay for the theater presentation located within the hotel; it looks terrific. I highly recommend this hotel for EIU events or a trip to Arcola, Illinois. Thank you so much for taking time to write us a review. We really enjoy when EIU has events and we get a chance to meet many of the parents and students. We happy to hear that you enjoyed your stay and hope to see you again during the next event! This is an exceptional hotel rates are less than $100 for a room. That is slightly more than others in the area but not that much. I stayed there twice and both times there were no other guests. It makes me scratch my head and wonder why. I've passed by there several other times and the lot is always empty. It maybe they need to offer discounts to get more guest in. If you are interested in the supernatural it is very close to Ashmore Il which has been featured on Ghost Adventures and there is a old cemetery behind hotel. The near by pumpkin patches make this a perfect Fall trip. Thank you for the review. We are happy to hear that you enjoyed your stays with us. We hope to see you again soon. We were impressed with the spaciousness of the room. It offered all that was needed, right down to earplugs provided in the room. The staff was very friendly and gave wonderful advice when asked about locations to eat. We will definitely consider staying again on our way through to a new area of the country that we will be frequenting. This motel was exceptional in every way. It is very new and everything is crisp and clean. Everything was exactly the way you'd want it to be during an overnight stay with breakfast next morning. The architecture is a little stark from the outside but it's very up-to-date. The access road was a little confusing but no big deal. Very, very clean! I felt I could walk barefoot- which is something I never do at a hotel. But I did here:-) Everything in the complex was fresh and new. Smelled new. I tend to get grossed easily if not cleaned or aging. Not here. The location is very close to the area we planned our visit for. I feel this is by far the best place to stay in the area. The adjoining theatre was a lot of fun. We saw Half Stitched The Musical. Very entertaining and well done. It was nice just to walk up to our room from there. Taste of the Prairie was to take place on site. That didn't turn out so well. Maybe 3 vendors set up. So we just went elsewhere. All in all it was a very wonderful stay!! We stayed at this hotel and had a great night. We will be staying here again. It's new, quiet, very pretty, and we had a wonderful experience. It's close to all the Amish Country and also close to Outlet Mall. Inside pool, that was great, work out room also great. I would recommend this hotel to anyone wanting a great place to stay.